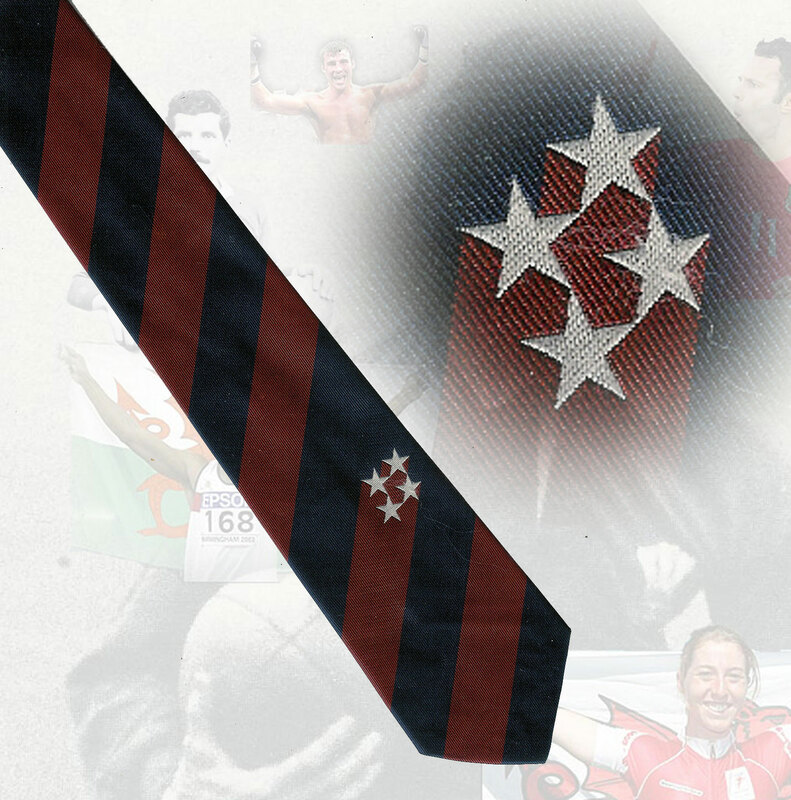 Welsh Sport - Memorabilia relating to the heroes, heroines and history of Welsh Sport. 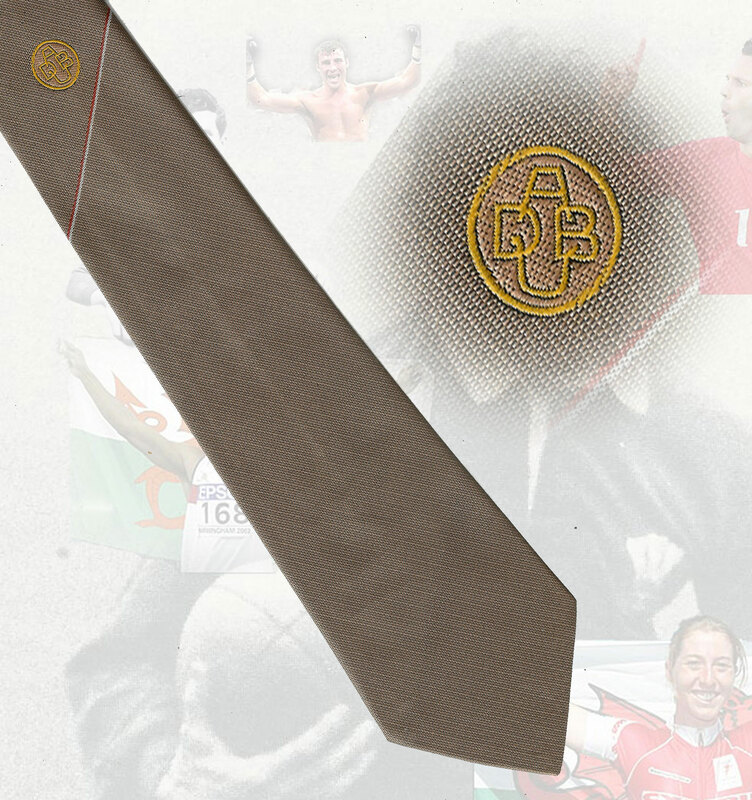 Click on the links below for more information or scroll down to see the great items on offer. 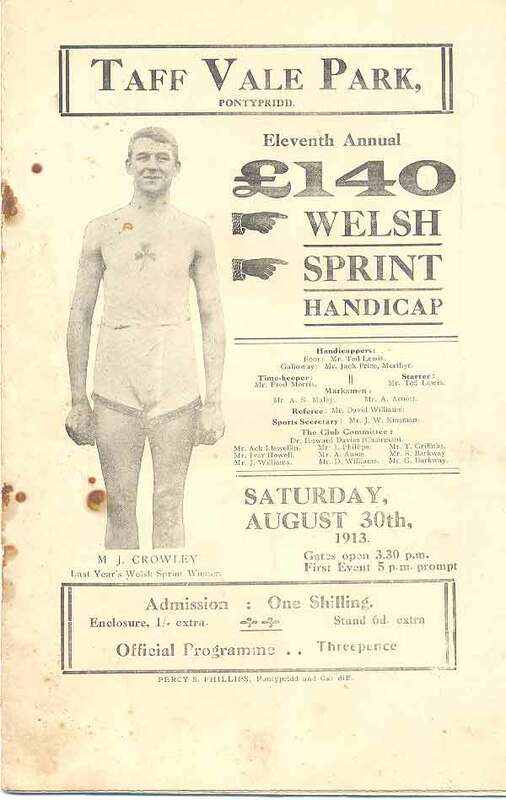 Eleventh Annual Welsh Sprint Handicap at Taff Vale Park, Pontypridd on Saturday 30 August 1913. A 12-page programme with rust marks to front cover and rusty staples. 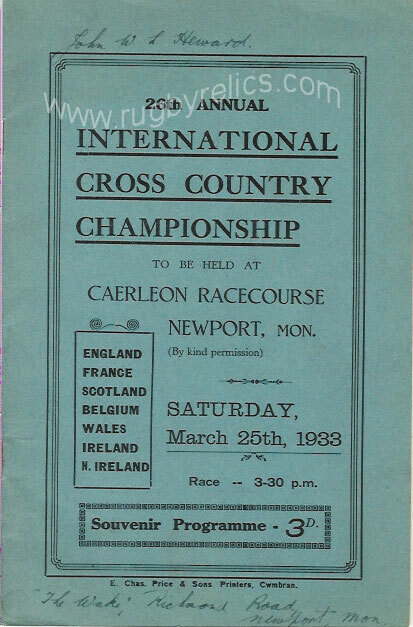 26th Annual International Cross Country Championships, Caerleon, Newport programme. The first International CC Champs were held in 1903 and were contested by the four home countries, gradually other countries joined the championships and it was awarded world championship status in 1973. 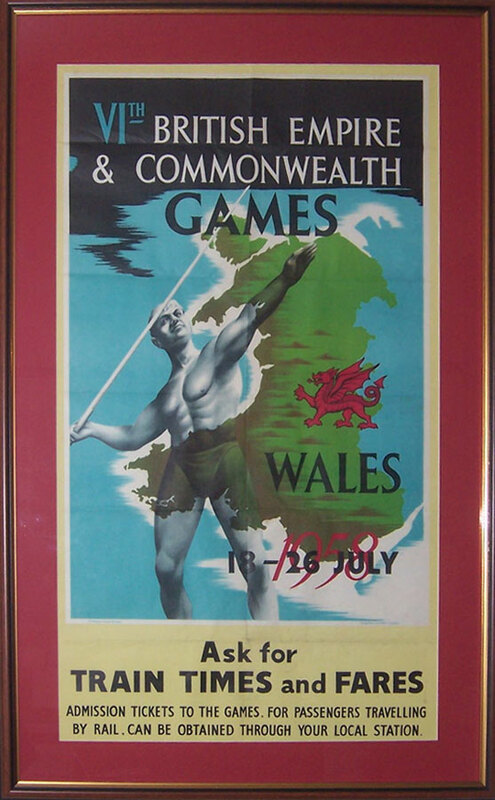 The first Welshman to win a medal was Sam Palmer with a bronze in in 1938, to date only two other third places have been recorded by Welshmen, John Merriman in 1960 and Steve Jones in 1984. The 1933 event is infamous for the friction between the North and South of Ireland, the North entered the competition for the very first time and the South withdrew despite already being pre-entered. The race was won by Jack Holden of England with the leading Welshman Harry Gallivan of Pontnewydd Harriers in 14th, Results of the race can be found on the following webpage. CLICK HERE . 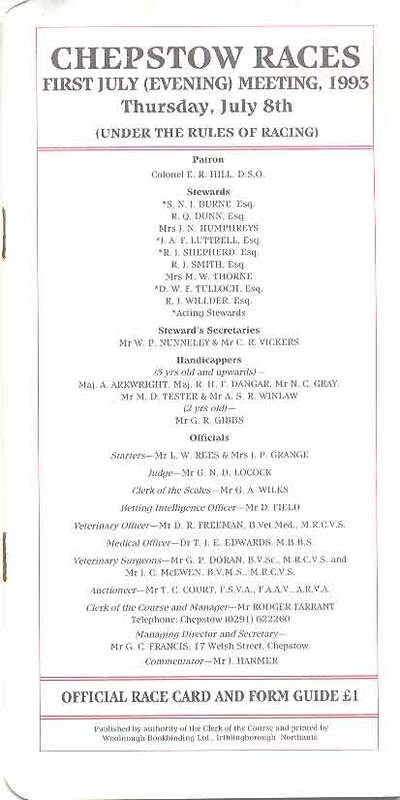 The 24 page programme is generally in good condition with a name and address written to the front and results filled in neatly throughout. 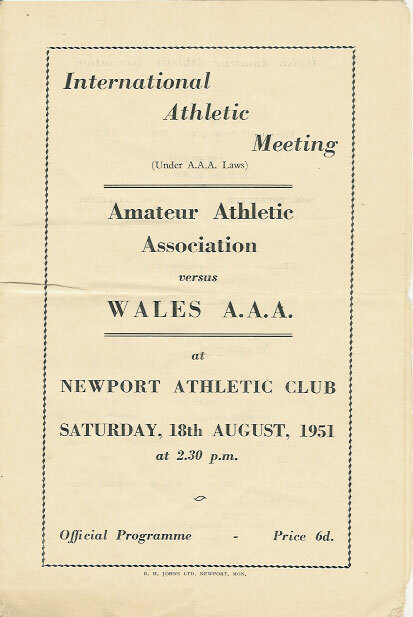 Wales AAA's v AAA's (Amateur Athletic Association) 18th August 1951 at Newport Athletic Club. - 12 page programme for this international meeting, folding creases and results inked in. 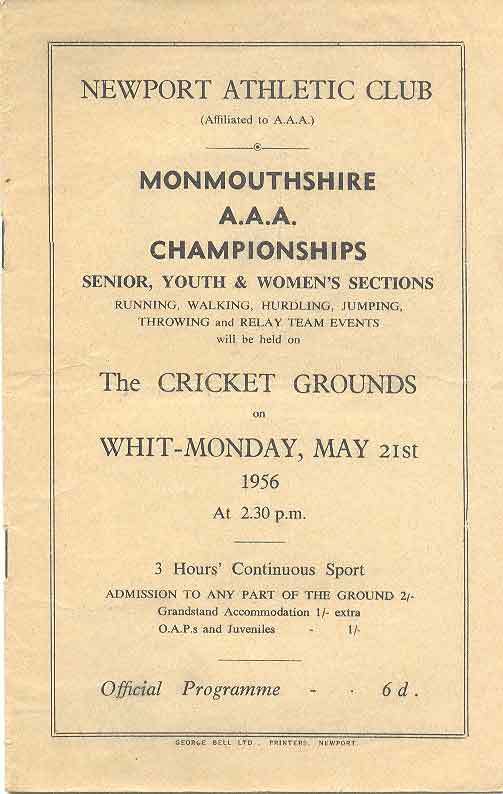 Monmouthshire AAA Championships at Newport Athletic Club on 21 May 1956. A 12-page programme in very good condition. 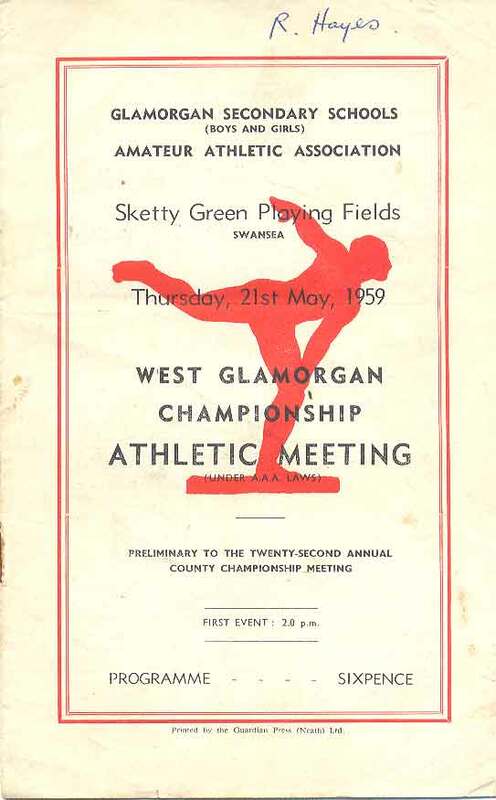 Glamorgan Secondary Schools' AAA West Glamorgan Championship Meeting at Sketty Green Playing Fields, Swansea on 21 May 1959. A 12-page programme with a name on the front cover, creased and rusty staples. 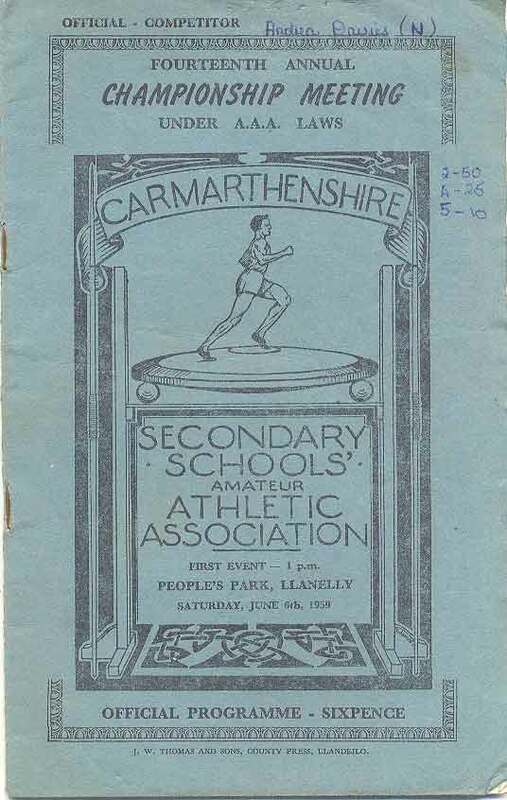 Carmarthenshire Secondary Schools' AAA 14th Annual Championship Meeting at People's Park, Llanelly on 5 June 1959. A 20-page programme with writing on front cover, some light creasing, a torn page and rusty staples. 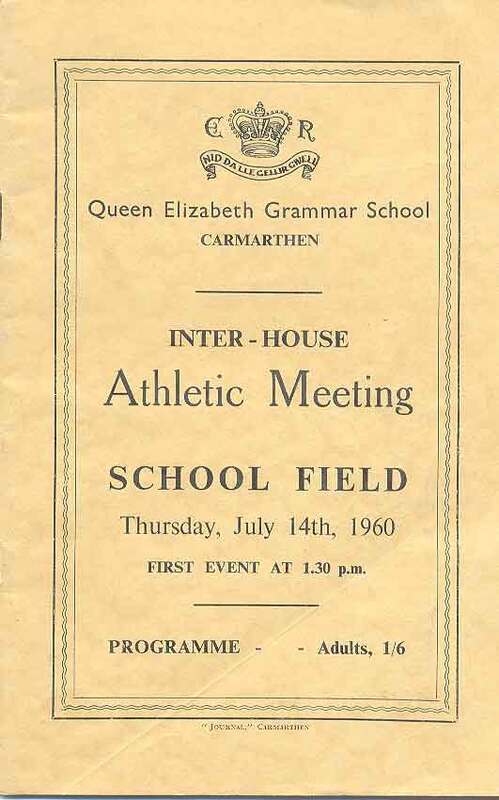 Queen Elizabeth Grammar School, Carmarthen Inter-House Athletics Meeting at School Field on 14 July 1960. 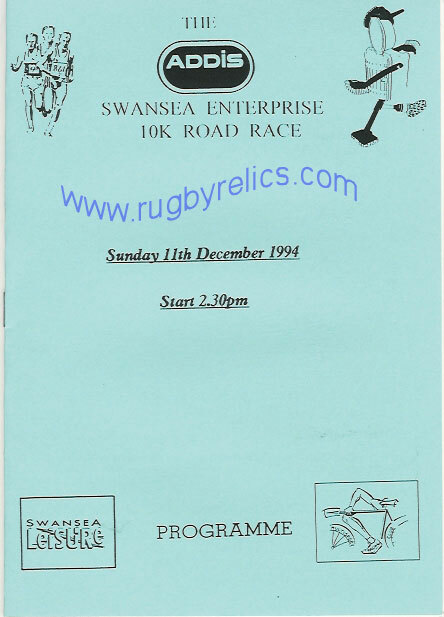 A 32-page programme with results inked in, includes TGR (Gerald) Davies the legendary Wales wing in the 100 yards hurdles, one crease otherwise in very good condition. 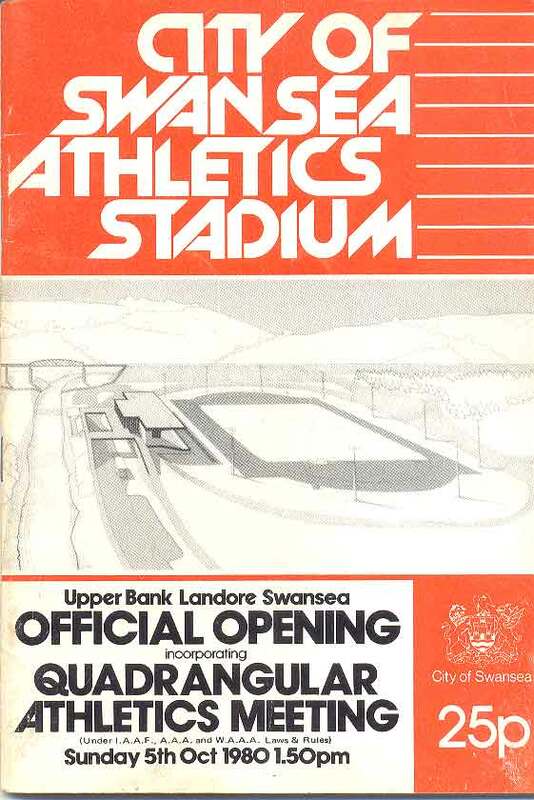 Official Opening of the City of Swansea Athletics (Morfa) Stadium incorporating quadrangular (Birchfield v Cardiff v South West wales Select v Swansea) athletics meeting at Upper Bank, Landore, Swansea on 5 October 1980. 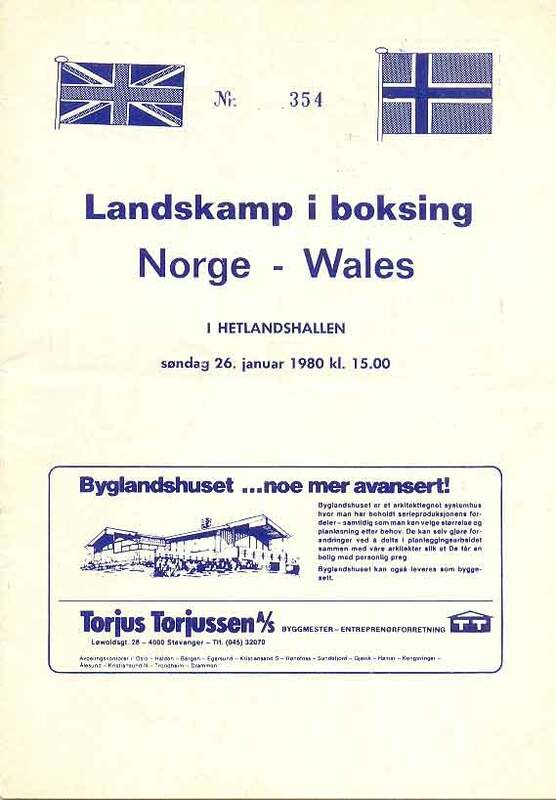 A 52-page programme with folding crease. 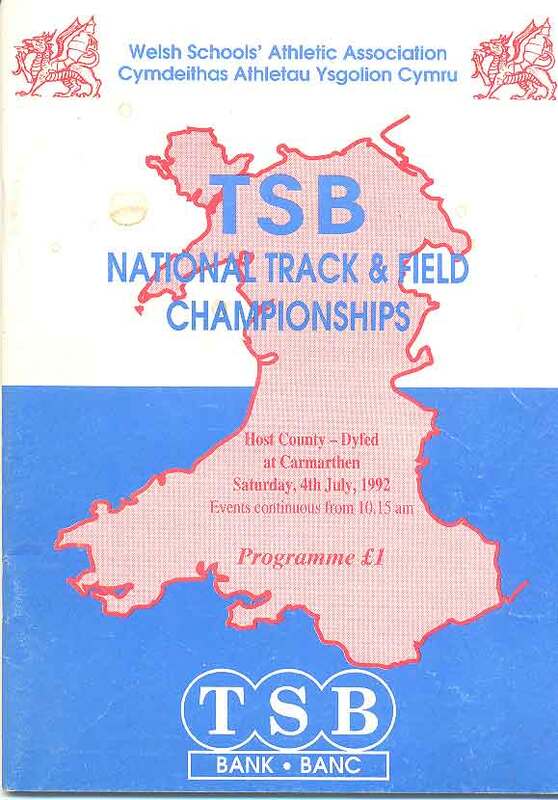 Welsh Schools' National Track & Field Championships at Carmarthen on 4 July 1992. A 52-page programme with marks on front cover otherwise in very good condition. 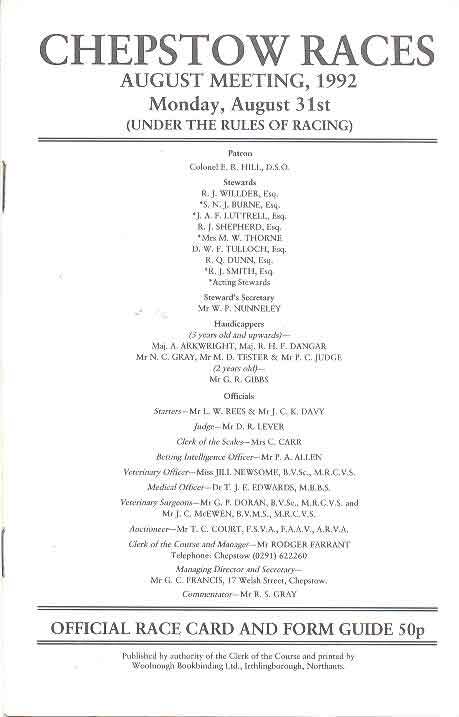 Addis Swansea Enterprise 10K Road Race 1994. Race won by Olympian Steve Brace of Bridgend. Super8 at Cardiff International Sports Stadium on 10 June 2009. 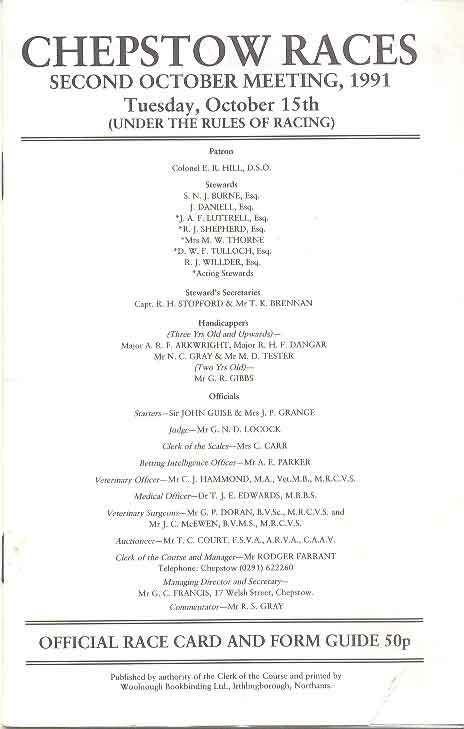 This was the first Super8 meeting, 8 teams from 8 cities: Cardiff, Birmingham, Glasgow, London North, London South, Manchester & Sheffield. A 32-page programme in very good condition. 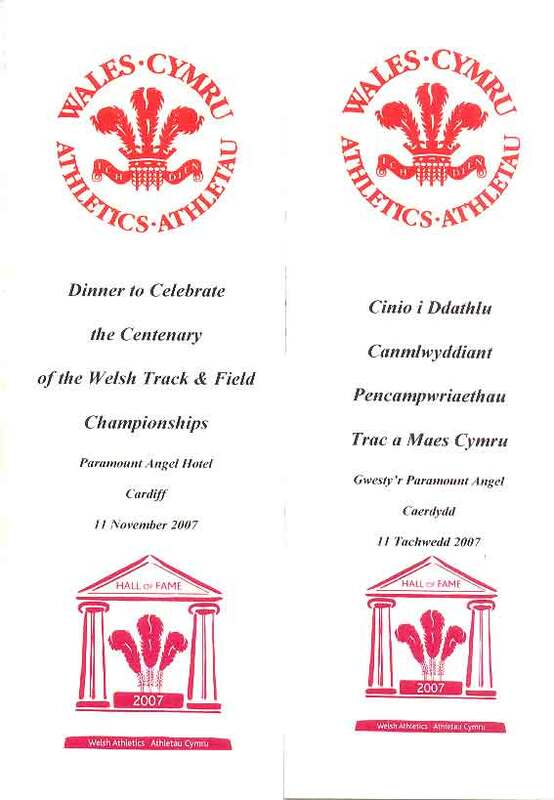 Dinner to celebrate the Centenary of the Welsh Track & Field Championships at the Paramount Angel Hotel, Cardiff on 11 November 2007, in very good condition. 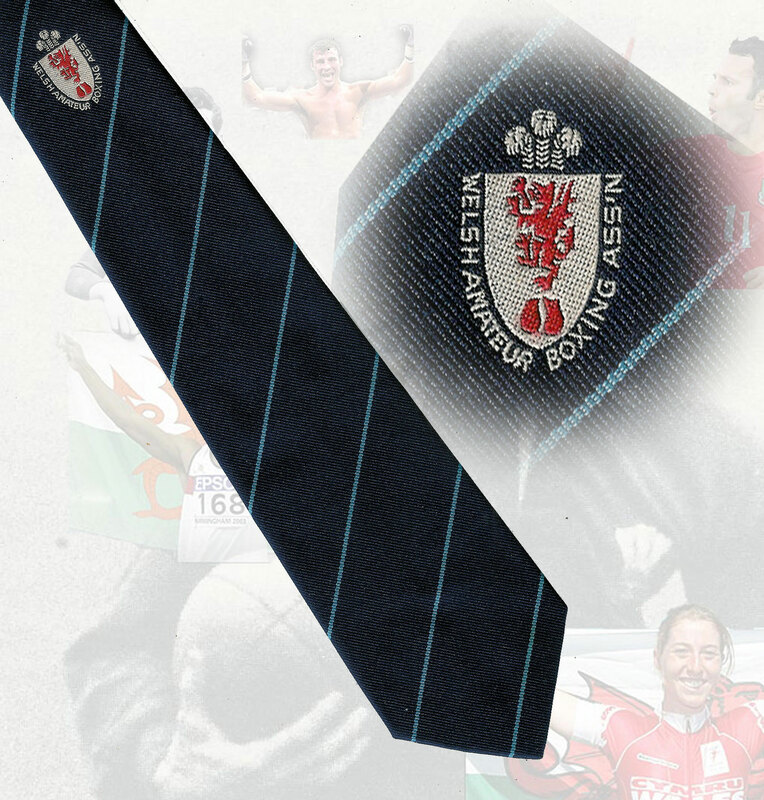 Wales Senior Women's Athletics vest. 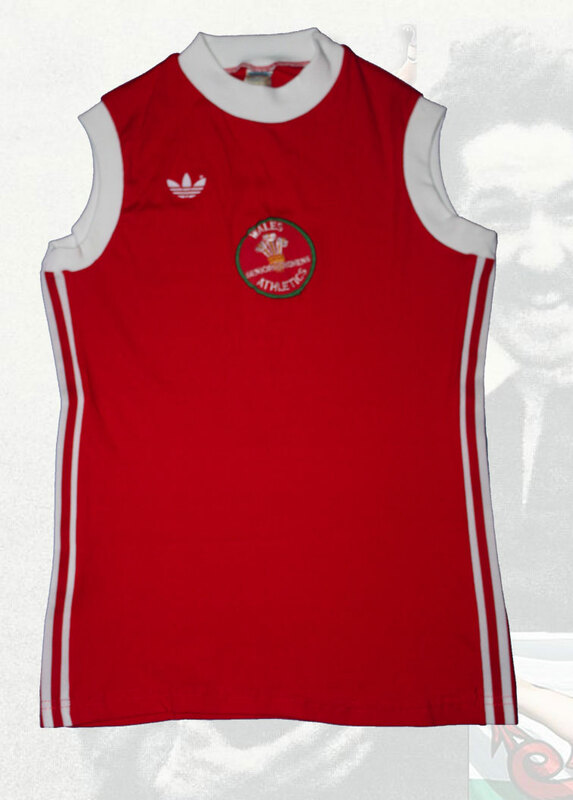 Red with white trim, made by Adidas, 100% polyamide, no size on label, it's small but very stretchy ! the badge is a little bit wonky but genearlly the vest is in very good condition. 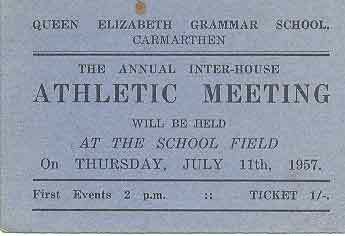 Queen Elizabeth Grammar School, Carmarthen Inter-House Athletic Meeting at School Field on 11 July 1957. Slight mark on ticket otherwise in very good condition. 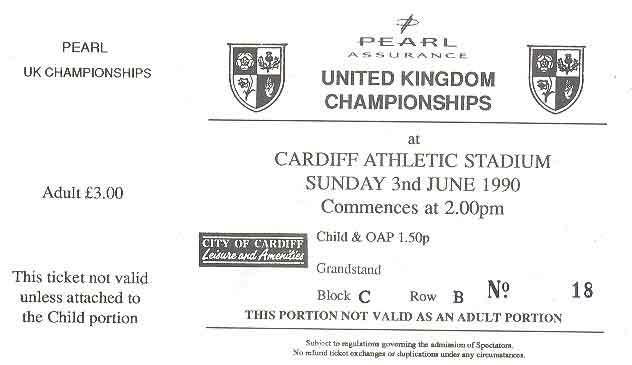 UK Athletics Championships at Cardiff Athletic Stadium, Leckwith Road, Cardiff on 3 June 1990, in very good condition. 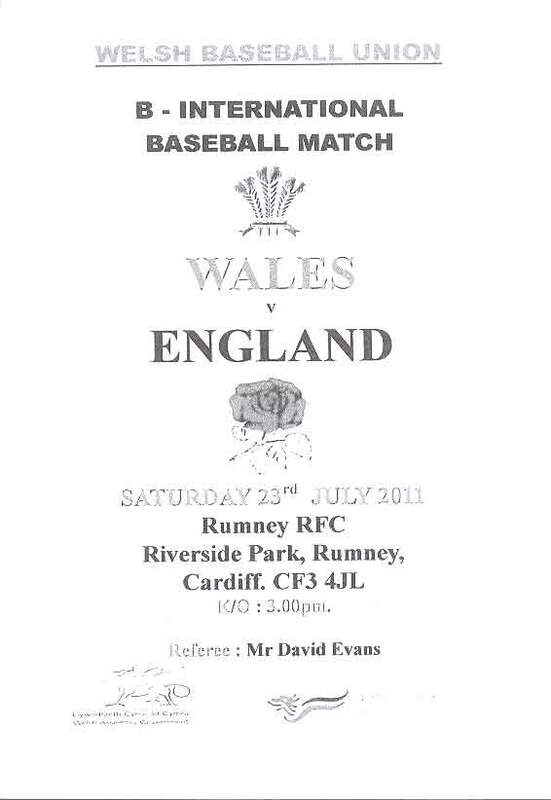 Wales B v England B programme at Riverside Park, Rumney, Cardiff on 23 July 2011. very good condition. 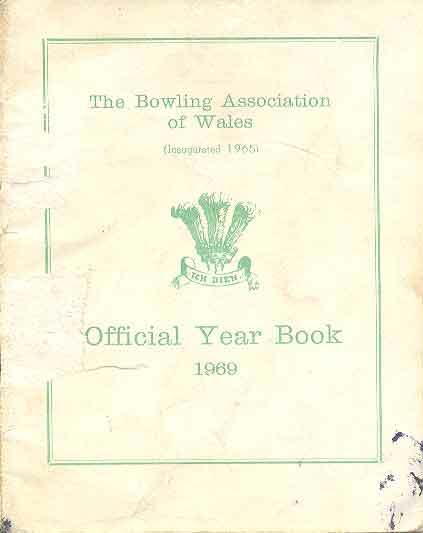 Bowling Association of Wales Official Year Book 1969. 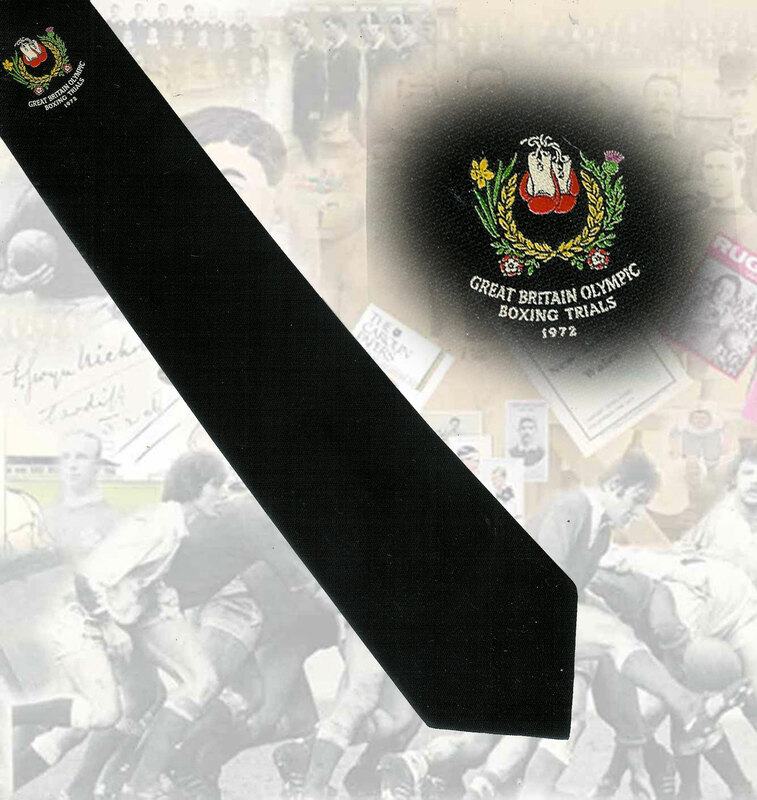 Includes photos of officers, fixtures, competition results, accounts, club information etc, 44 pages with covers torn & marked. 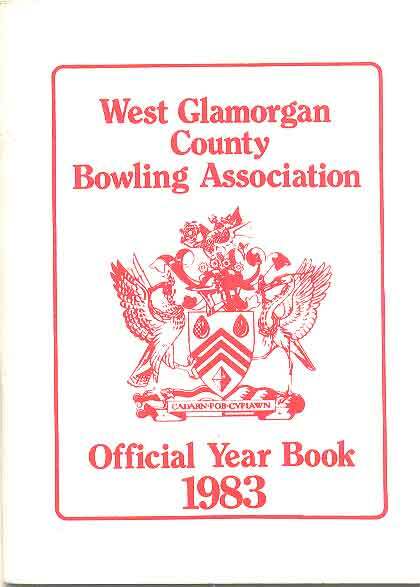 West Glamorgan County Bowling Association Official Year Book 1983. Includes photos of competition winners, fixtures, competition results, championship records, club information etc, 64 pages in very good condition. 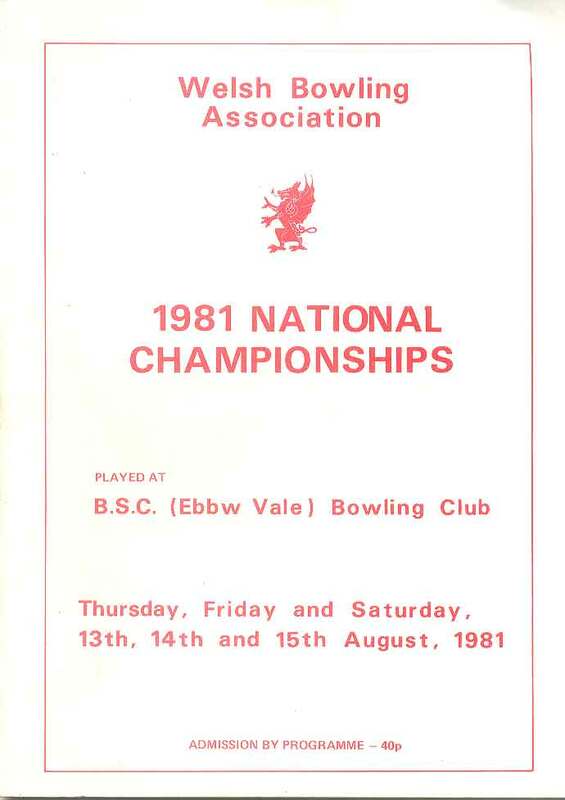 Welsh Bowling Association 1981 National Championships at BSC (Ebbw Vale) Bowling Club 13-15 August 1981. 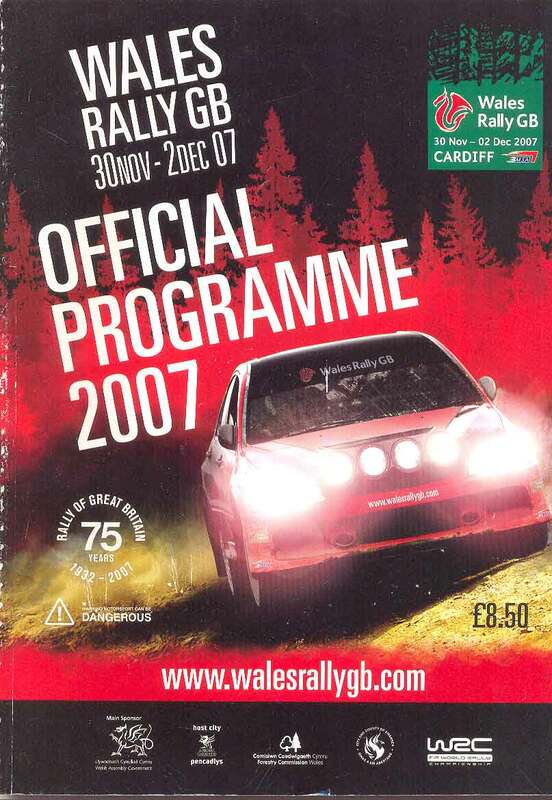 A 16-page programme in very good condition. 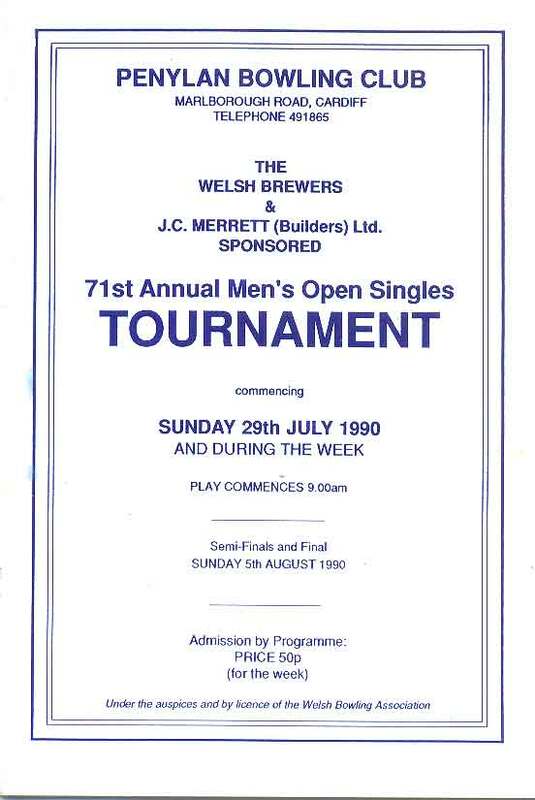 Penylan Bowling Club, Cardiff - 71st Annual Men's Open Singles Tournament commencing 28 July 1990 (and during the week). A 20-page programme in very good condition. 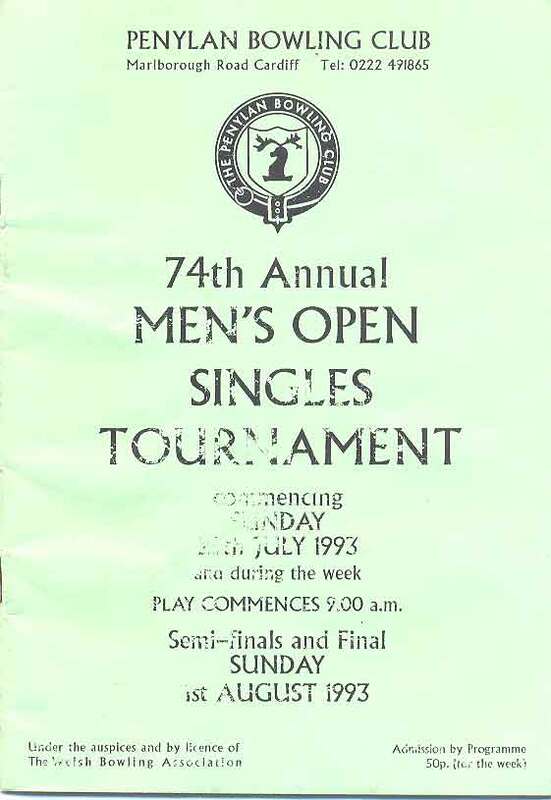 Penylan Bowling Club, Cardiff - 74th Annual Men's Open Singles Tournament commencing 25 July 1993 (and during the week). 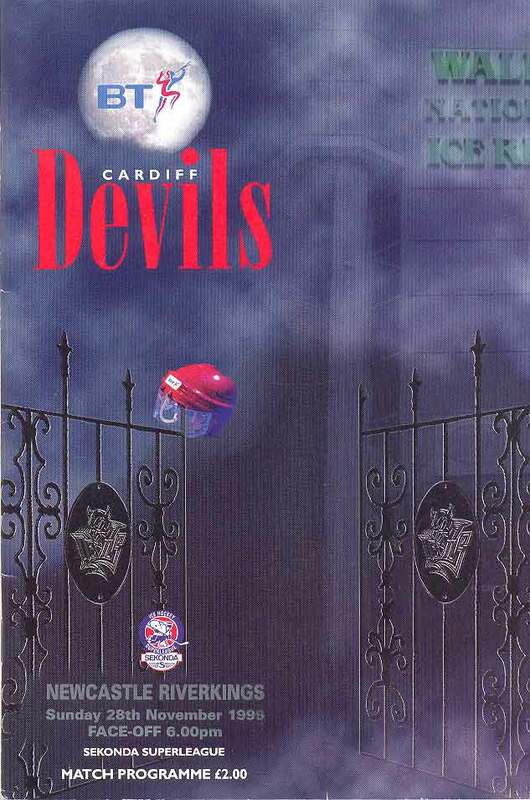 A 20-page programme slight creases and some print fading on front cover. 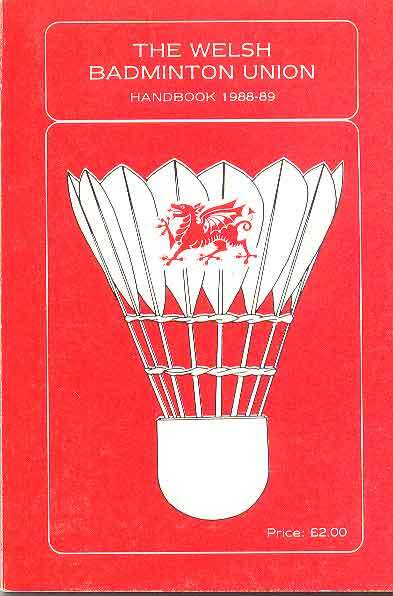 Dai Dower - "yours in sport Dai Dower" - clipped and added to card. 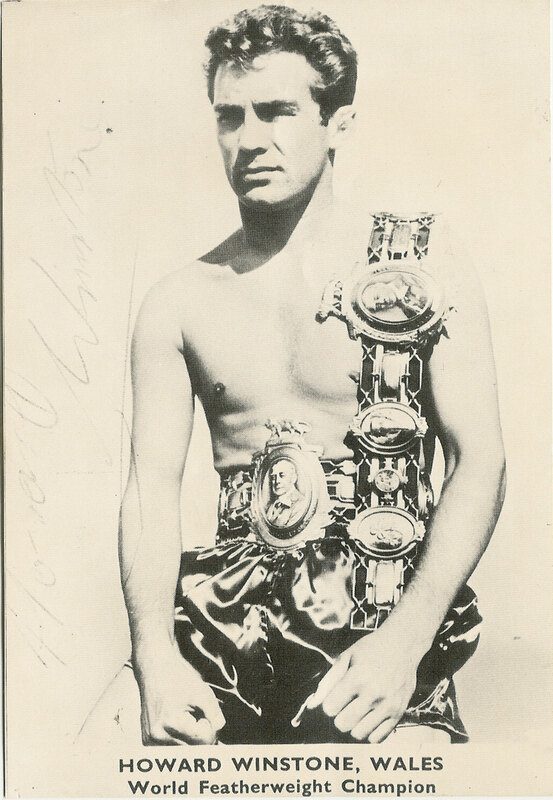 Dai Dower MBE (born Abercynon 1933) was a British Empire and European flyweight boxing champion, after a successful amatuer career he fought professionally in 1953-57, in 37 fights he won 34 bouts with 12 knockout wins. 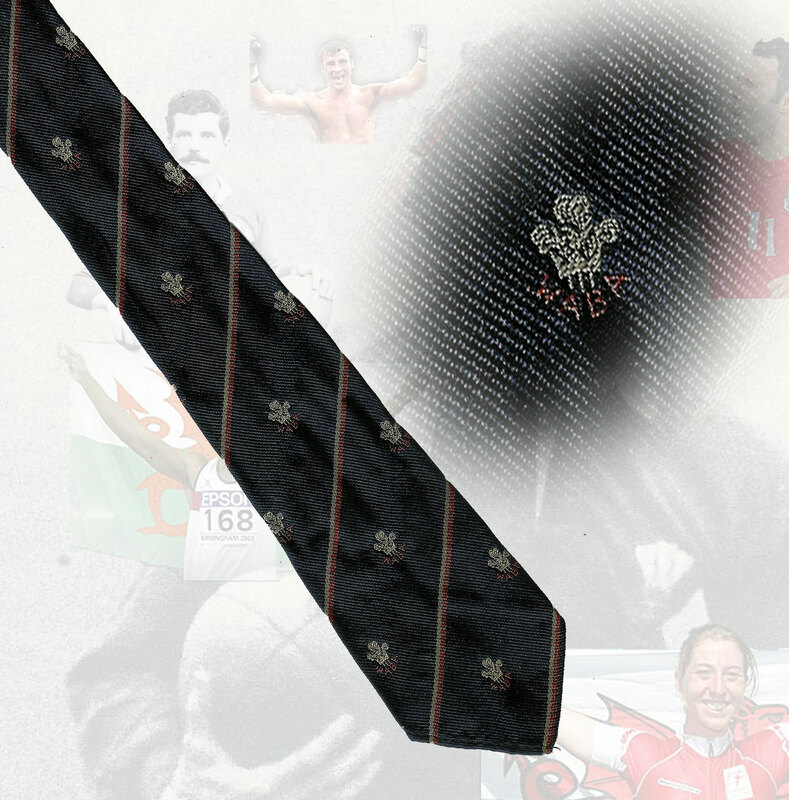 In later life he was head of sport at Bournemouth University and was awarded an MBE for services to sport. 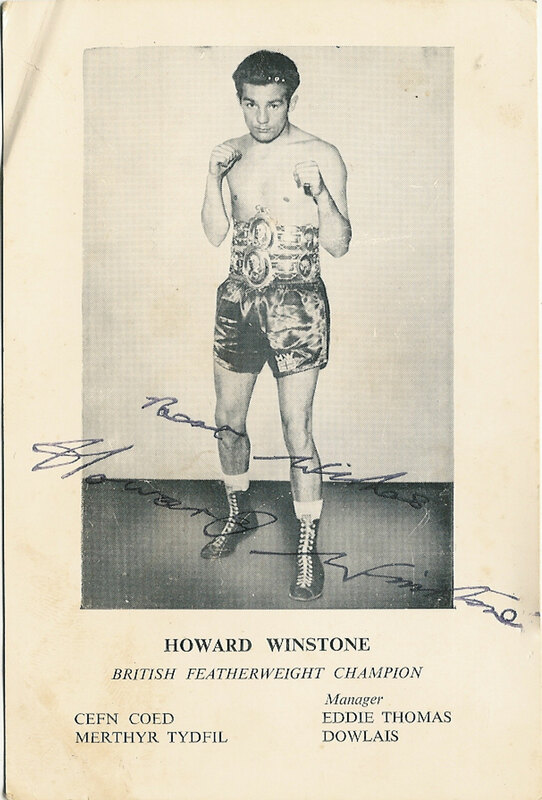 Howard Winstone, Merthyr Tydfil signed boxing 6"x4" (15cm x 12cm) postcard, plain back, small corner fold to the top left hand corner. 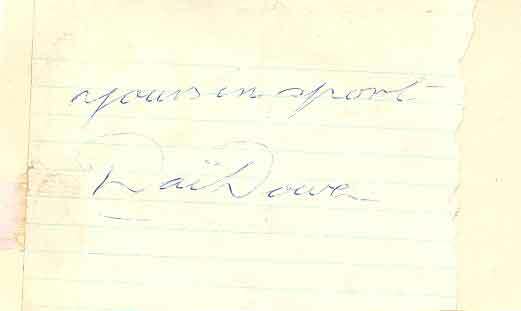 Sold together with a COA guaranteeing the authenticity of the signature. 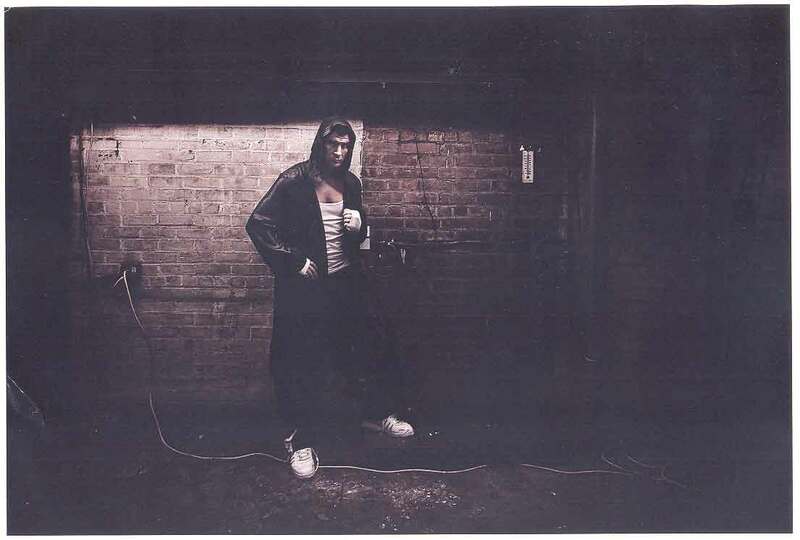 Howard Winstone, Merthyr, Wales, World Featherweight Boxing Champion signed 8"x6" (20cm x 15cm) photograph, some fading to the signature. Sold together with a COA guaranteeing the authenticity of the signature. 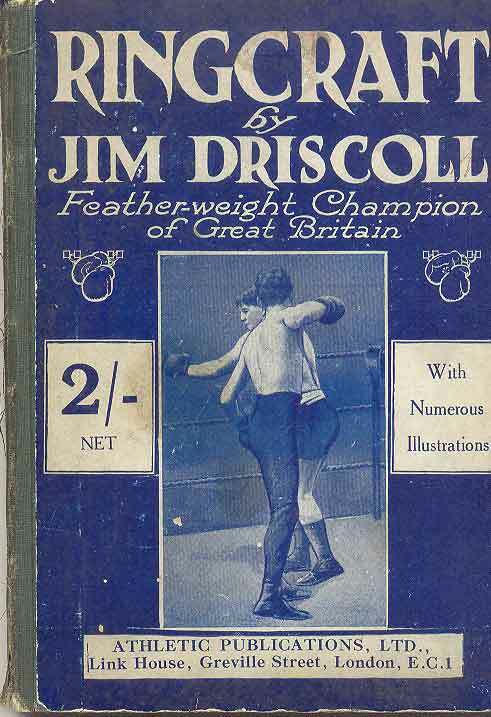 Ringcraft by Jim Driscoll, Featherweight Champion of Great Britain, instructional with several illustrations, published by Athletic Publications Ltd, 6th edition, undated, circa 1916, an 80-page hard-back book in good condition, . 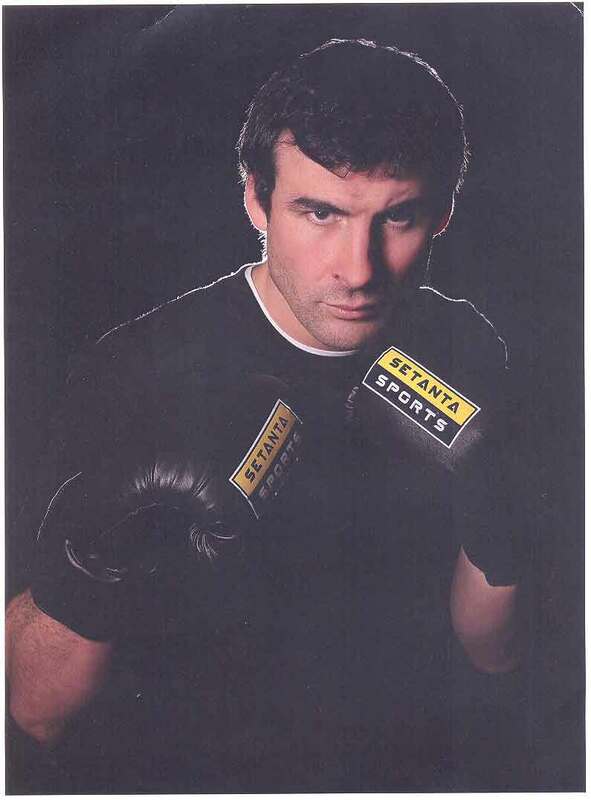 Joe Calzaghe - 2 A4 colour promotional photographs in very good condition, small corner fold to portrait photo. 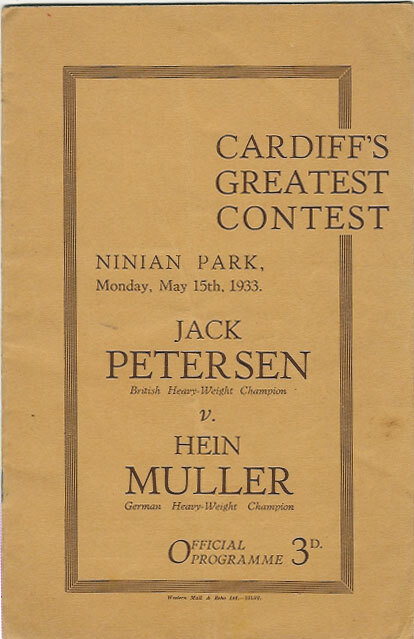 Ninian Park, Cardiff, 15 May 1933, Jack Petersen v Hein Muller (Germany), fights on the undercard are as follows: Panther Purchase (South Africa) v Jack Domorgen (Germany), George Morgan (Newport) v Fred Carpenter (Merthyr), Jerry Daley (Penygraig) v George Smith (Tonyrefail). 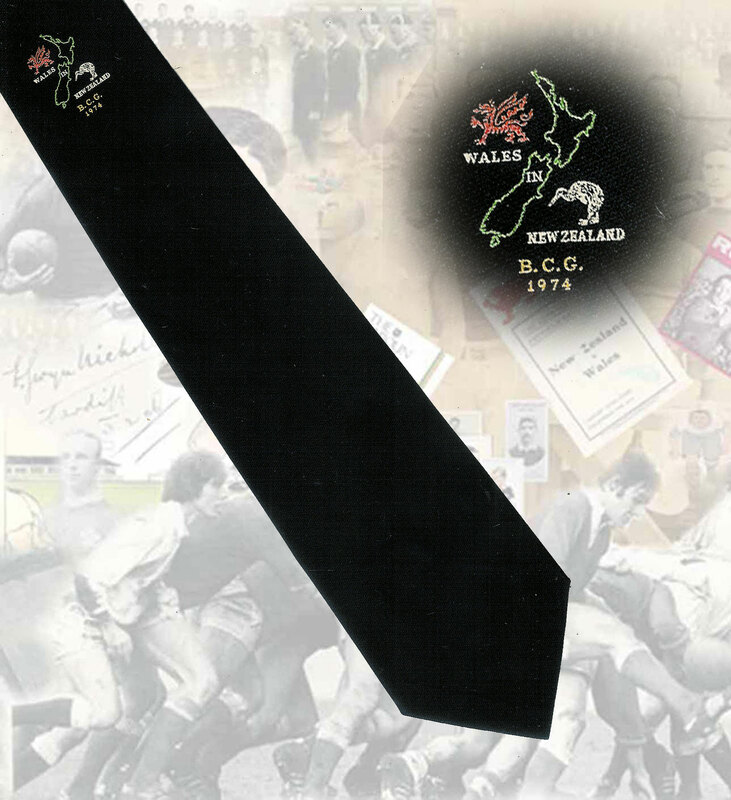 The 12 page programme has a single crease down the centre of the front cover. 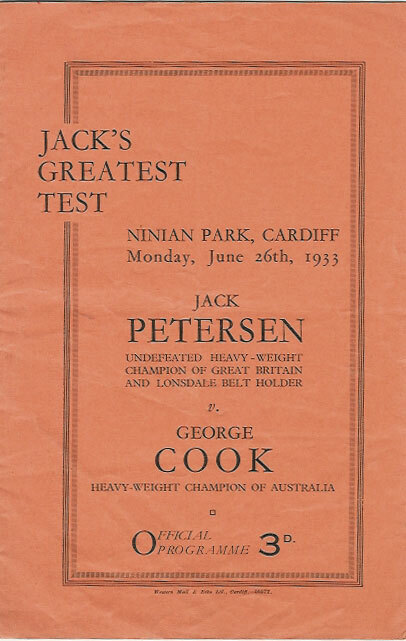 Ninian Park, Cardiff, 26 Jun 1933, Jack Petersen v George Cook (Australia), fights on the undercard are as follows; Gipsy Daniels (Llanelly) v Laurie Raiteri (Stratford), Gunner Bennett (Windsor) v Tommy Farr (Clydach Vale), Bert Taylor (Birmingham) v Les Howard (Cardiff). 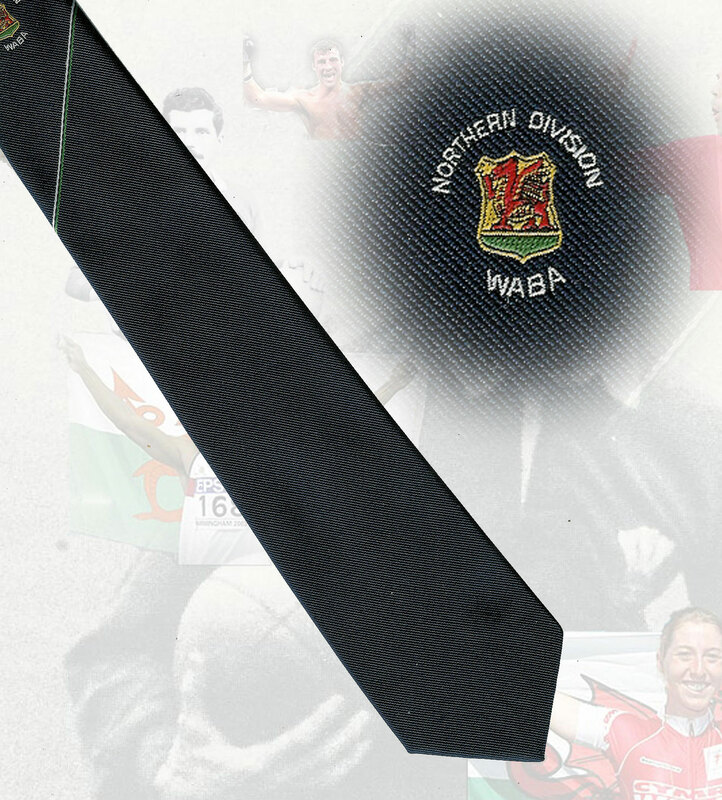 The 12 page programme has a single crease down the centre of the front cover. 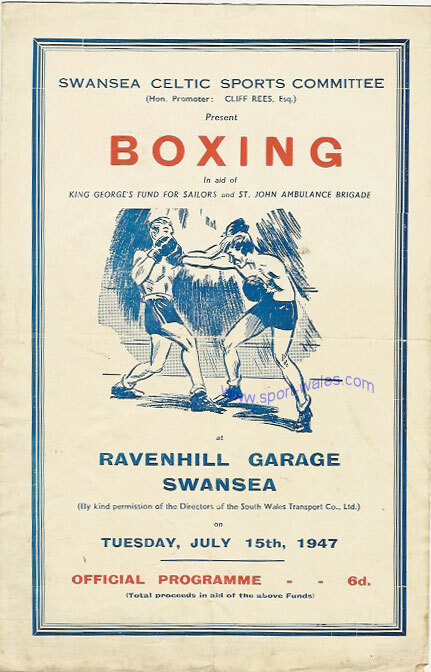 International Boxing Tournament at Market Hall, Carmarthen on 16 May 1955. 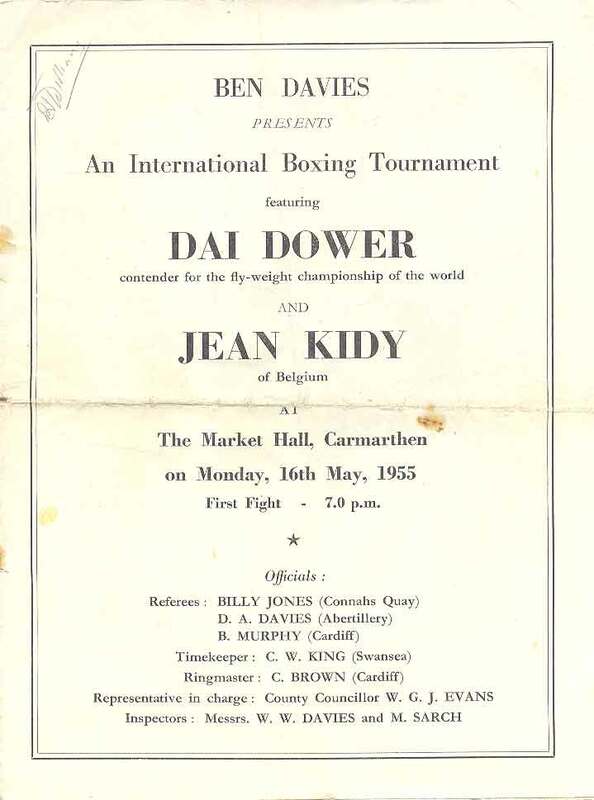 Dai Dower (contender for the Flyweight Championship of the World from Wales) v Jean Kidy (Belgium), Kurt Ernst (Austria) v Emrys Jones (Oswestry), Parry Dando (Llanhilleth) v Eric Billington (Colborne), Simon Templar (Jamaica) v C Purnell (Bath), Peter Bunt (Pontypridd) v R Griffiths (Llanboidy), L Barrow (Swansea) v Eddie Williams (Tredegar). Folding crease and marked with rusty staples. 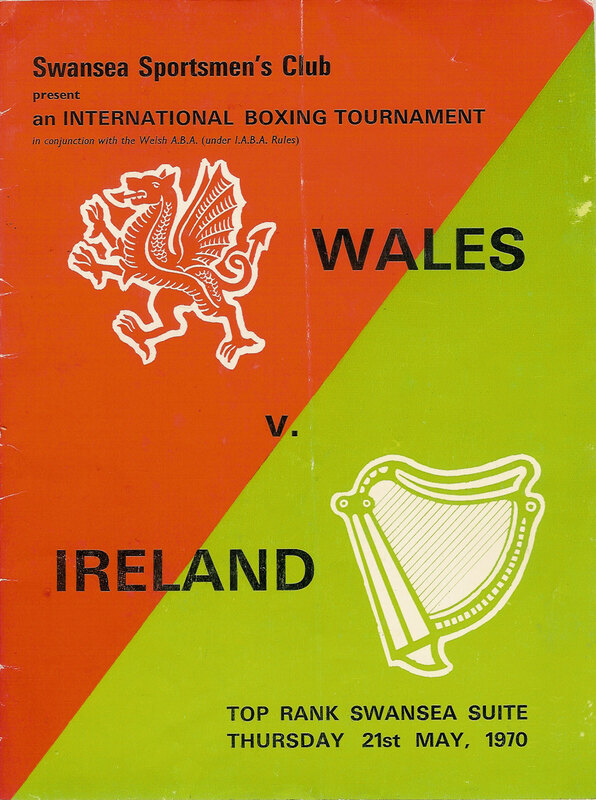 Norway v Wales Amateur Boxing International at Hetlandshallen on 26 January 1980. Folding crease. 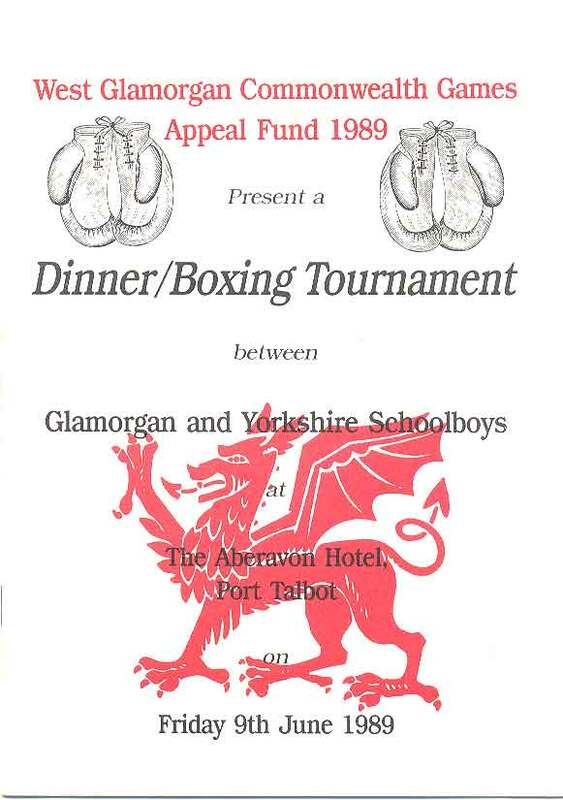 Glamorgan Schoolboys v Yorkshire Schoolboys Amateur Boxing Tournament at The Aberavon Hotel, Port Talbot on 9 June 1989, slight crease, good condition. 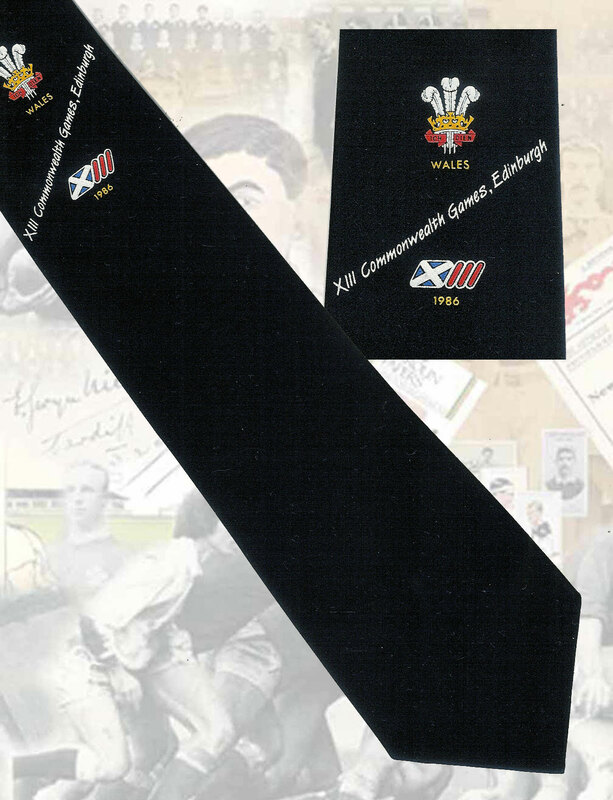 The following ties are from the collection of a former Welsh boxing referee who travelled to the Commonwealth Games on several occasions as a team manager and boxing referee at the games. 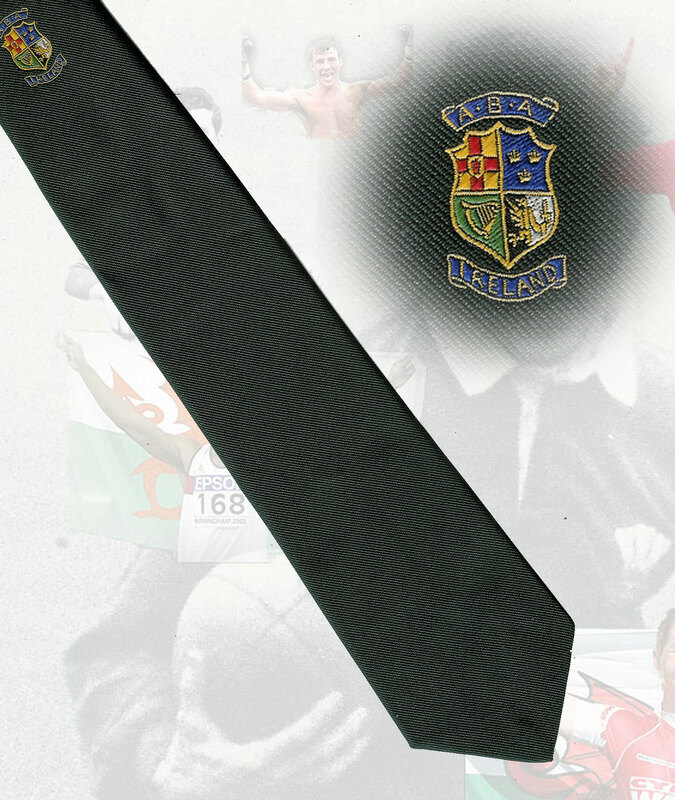 Cricket memorabilia relating to Glamorgan including from the 1948 & 1969 championship seasons, 1993 Sunday League Championship including scorecards, programmes, autographs, books, yearbooks, ties etc. 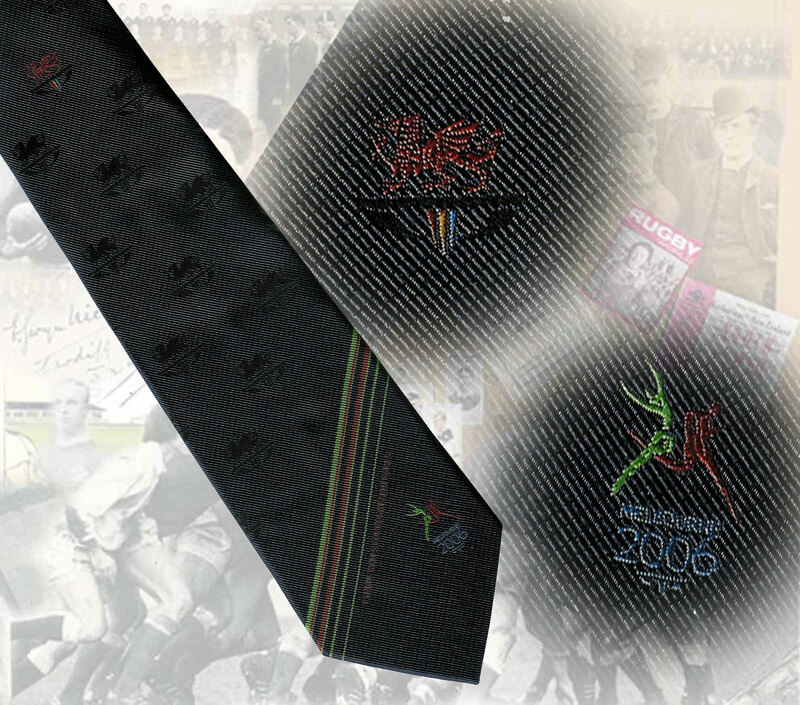 Other memorabilia relating to Welsh cricket can also be found on this page including club histories & ties. To visit this page please click on the image above or the links below to go straight to individual sections on this page. 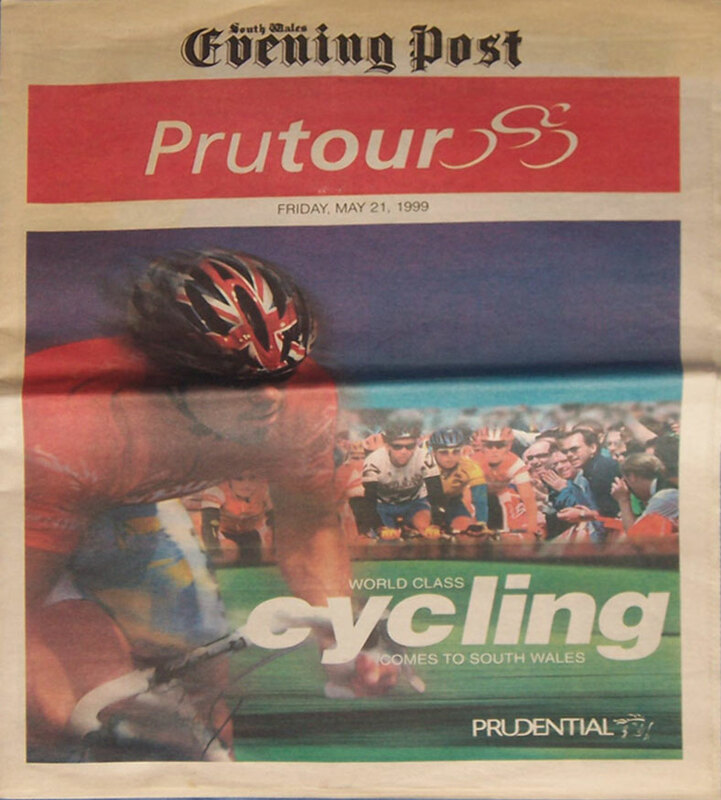 South Wales Evening Post Prutour 1999 supplement, an 8 page newspaper with info about the Prutour's visit to Swansea. 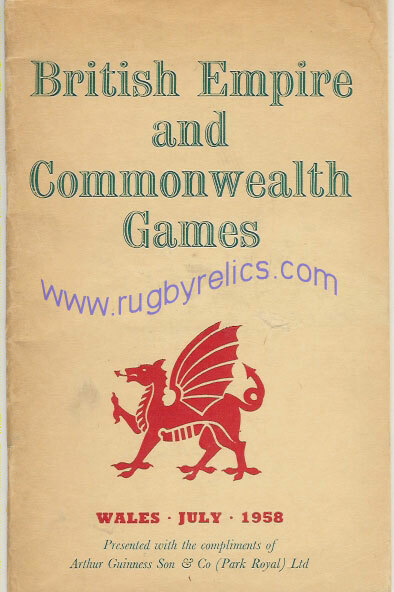 BRITISH EMPIRE GAMES, Cardiff 1958. - 54 page guide published by Guinness. A concise and information packed preview of the Games. In good condition. 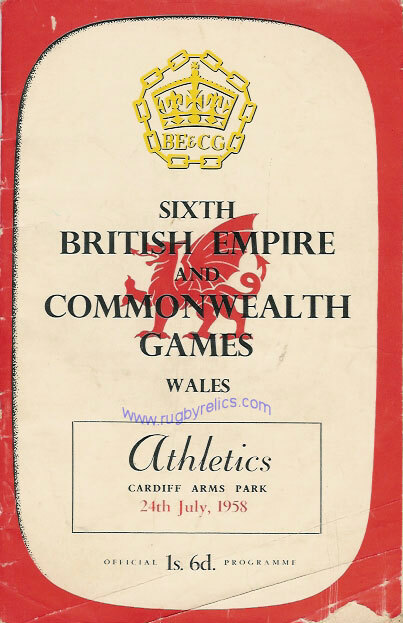 BRITISH EMPIRE GAMES, Cardiff 1958. - Official programme for Athletics on 22nd July including women's high jump, 880 yards final, men's long jump final & 3 miles. In very good condition with the majority of results added to the event pages in pencil. 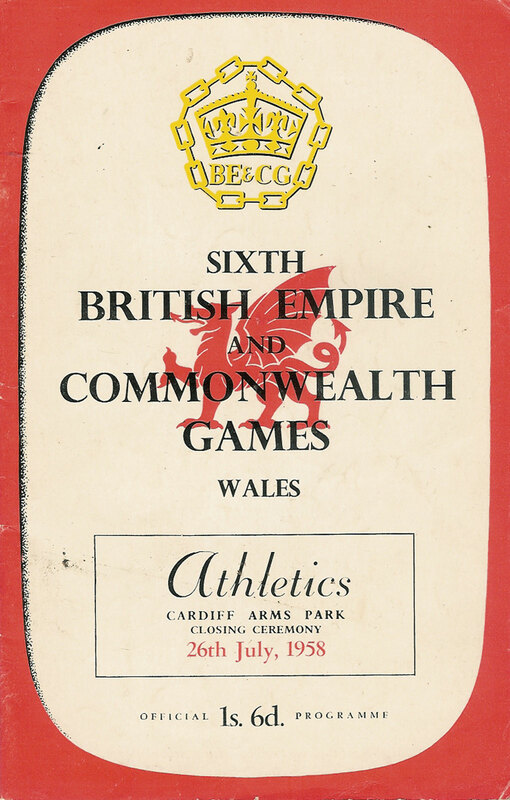 BRITISH EMPIRE GAMES, Cardiff 1958. - Official programme for Athletics on 24th July including women's 220 yards, men's 220 yards, hurdles heats, javelin, & men's 1 mile heats, very good. 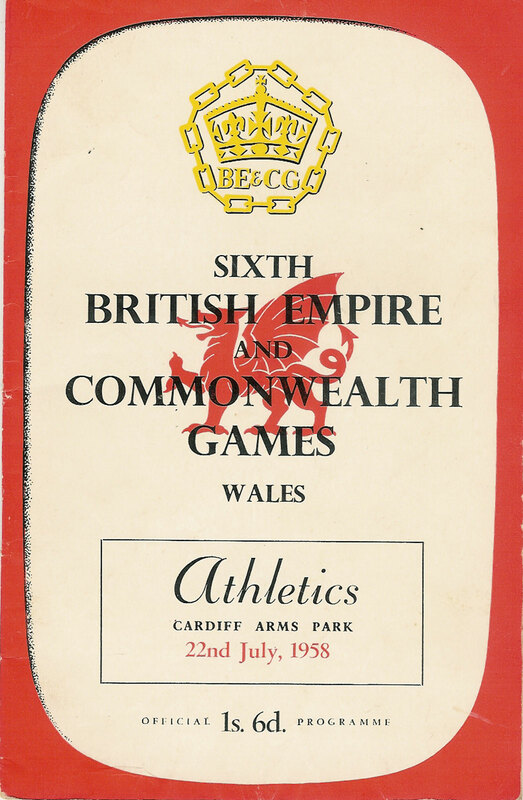 BRITISH EMPIRE GAMES, Cardiff 1958. 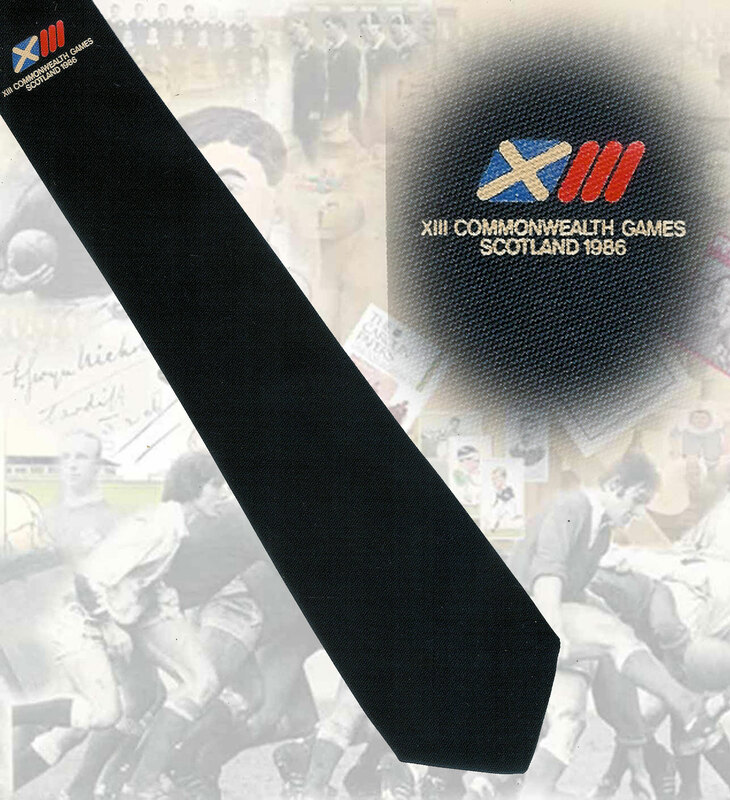 - Official programme for Athletics on 26th July, the last day of competition. Events include, (all finals) women's long jump, hammer, pole vault, 4 x 110 yards relay, 4 x 440 yards relay, women's 80 metres hurdles, one mile. The majority of results are inked in, generally the condition is very good. 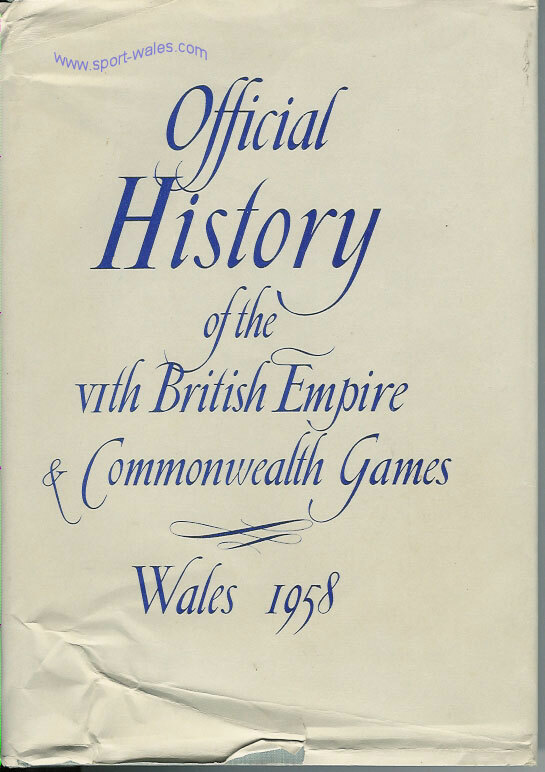 "The Official History of the VI th British Empire and Commonwealth Games, Wales 1958." 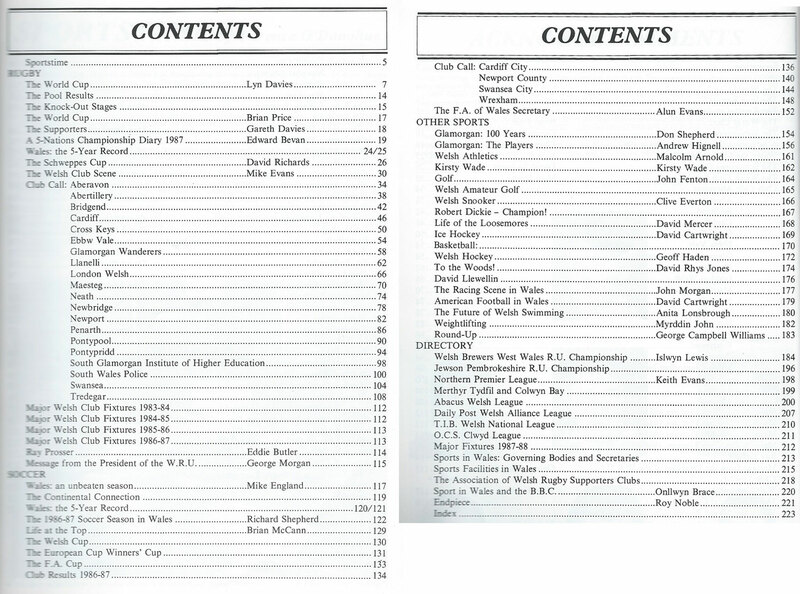 A 508 page review of the Games published by the Western mail & Echo. 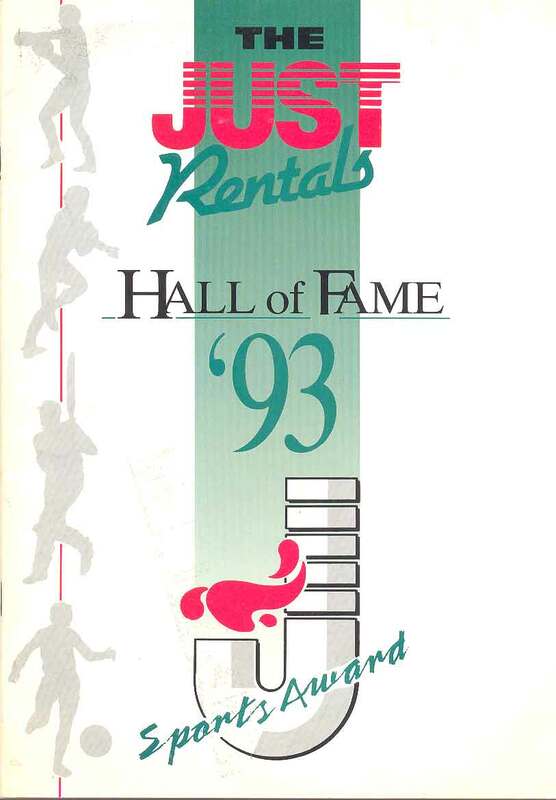 Includes a complete set of results for all sports and many photos of competitors and sports. This copy has a small amount of creasing and a minor tear to the dust wrapper otherwise it is in mint condition, it is still in it's original box. 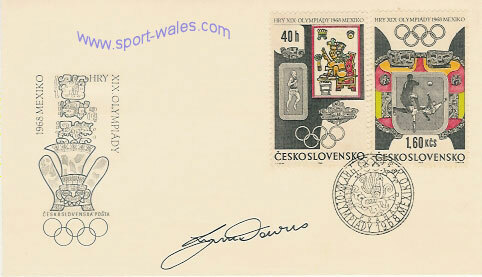 1968 Olympics First Day Cover (Czechoslovakia) signed by Olympic gold medallist Lynn Davies. Davies represented Great Britain at the games in Mexico City. 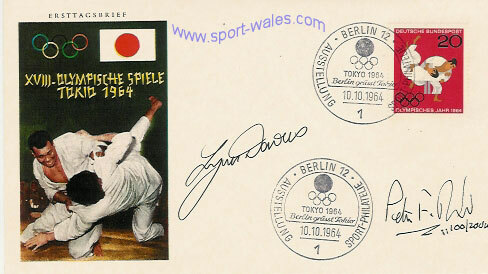 1964 Olympics First day Cover (Germany) signed by Olympic gold medallist Lynn Davies and Peter Radford who won two bronze medals in the 1960 olympics (100 mts & 4 x 100 relay). A nicely illustrated cover with judo stamp and illustration. 1968 Olympics First day Cover (GB) with special departure postmark signed by 3 Olympic gold medallists, David Hemery (400m hurdles), Chris Finnegan (boxing) and Lynn Davies (long jump). Hemery & Finnegan won their medals at the 1968 games, Davies in 1964, he also competed in the 1968 & 1972 Olympic Games. 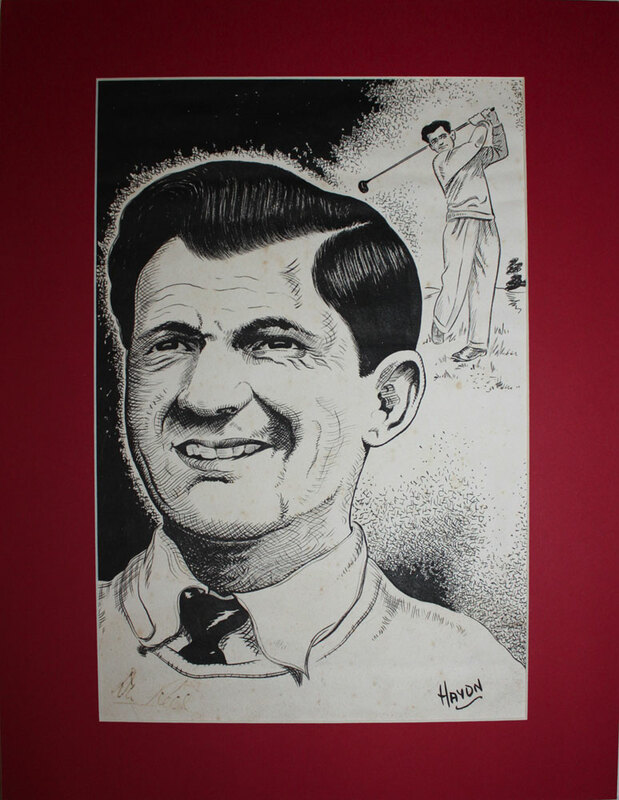 Dai Rees was one of the greatest Welsh golfers ever. Born in Aberdare, Dai learned his golf at the Aberdare Golf Club where his dad was the professional. The highlight of his career was when he led Britain to Ryder Cup success in 1957. In all he played in nine competitions against the Americans. He finished runner-up in the Open Championship in 1953, 1954 and 1961 and was the BBC and Welsh Sports Personality of 1957. He featured in adverts as one of the "Brylcreem Boys". 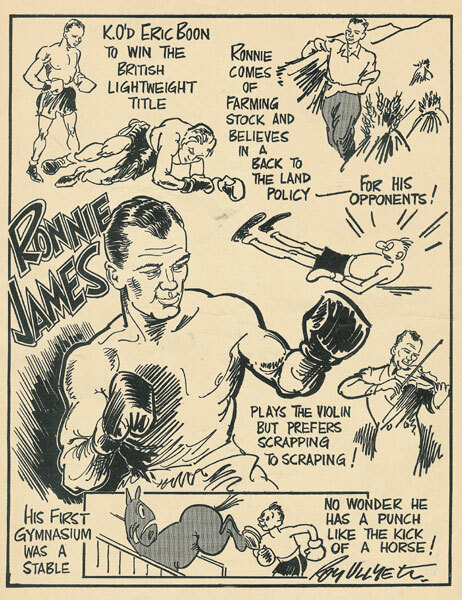 The illustration is by Neath artist Haydn Ford whose published works include a book of caricatures of the 1948 Invincible Australian cricketers and "Heads and Tails" a booklet of caricatures of 1950s Welsh rugby stars. This is an original one off caricature by Haydn Ford, Dai Rees has signed in the bottom left corner, the signature is faded but still legible. It is mounted and ready for framing. Total size 20" x 16" (51cm x 41cm). This is a fantastic oil on canvas by Welsh sports artist Jeff Williams. 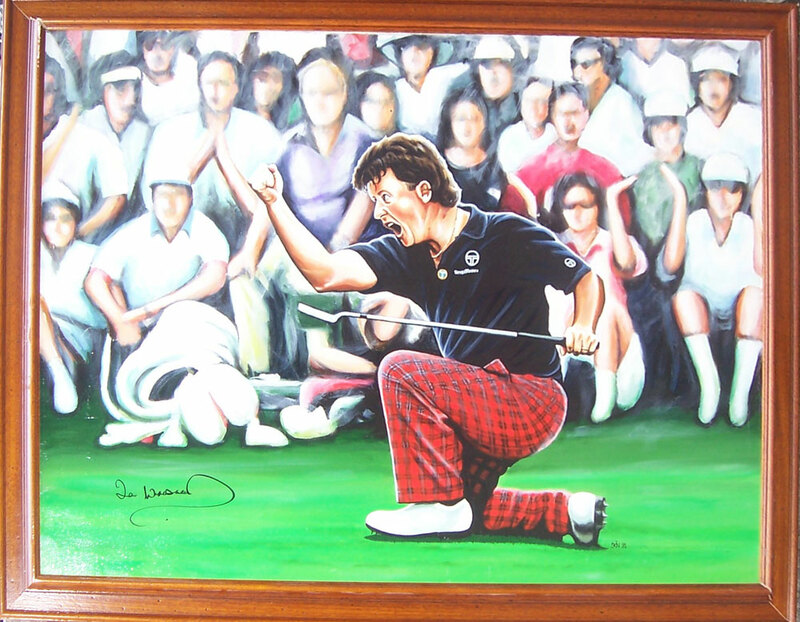 It pictures Ian Woosnam celebrating his great win at the US Masters in 1991. The large size (40" x 30") gives it a terrific life like appearance. 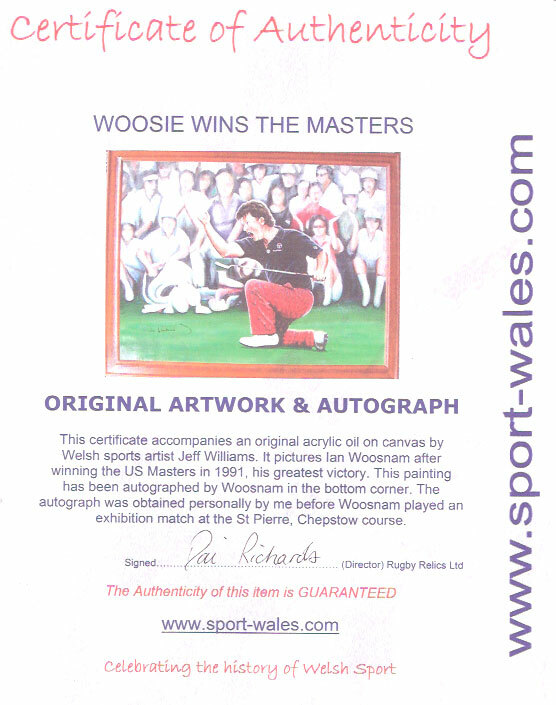 This painting has been personally autographed by Woosnam in the bottom corner, the autograph was obtained before Woosnam played an exhibition match at the St Pierre, Chepstow course. Please click on the image below to enlarge the thumbnail. A Certificate of Authenticy accompanies this item guaranteeing it's originality and the autograph. 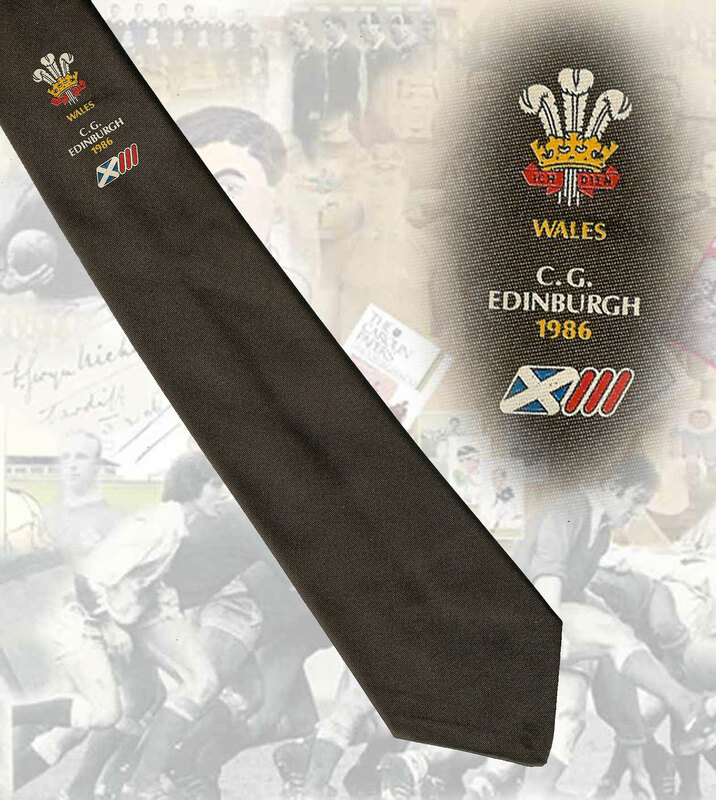 Celebrity Pro-Am Golf Tournament (Welsh Rugby Union) at St Pierre, Chepstow on 2 May 1983. Very good condition. 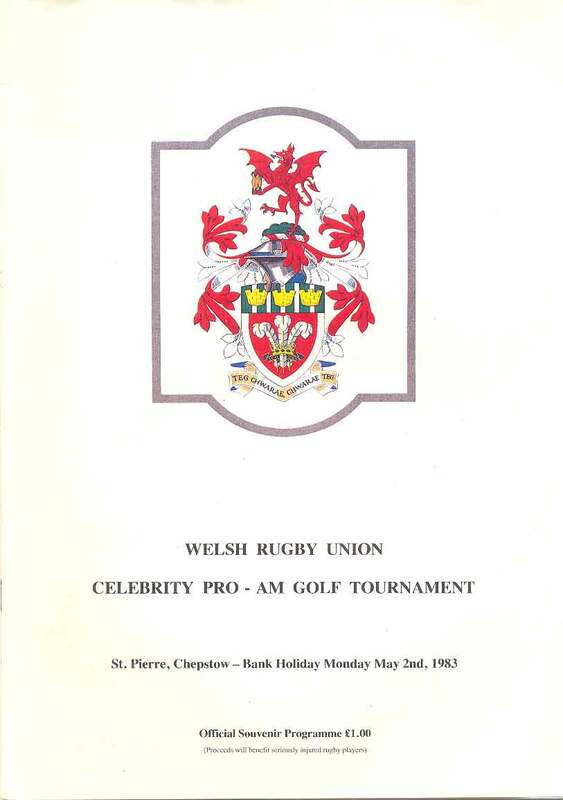 Celebrity Pro-Am Golf Tournament (Welsh Rugby Union) at St Pierre, Chepstow on 6 May 1985. very good condition. 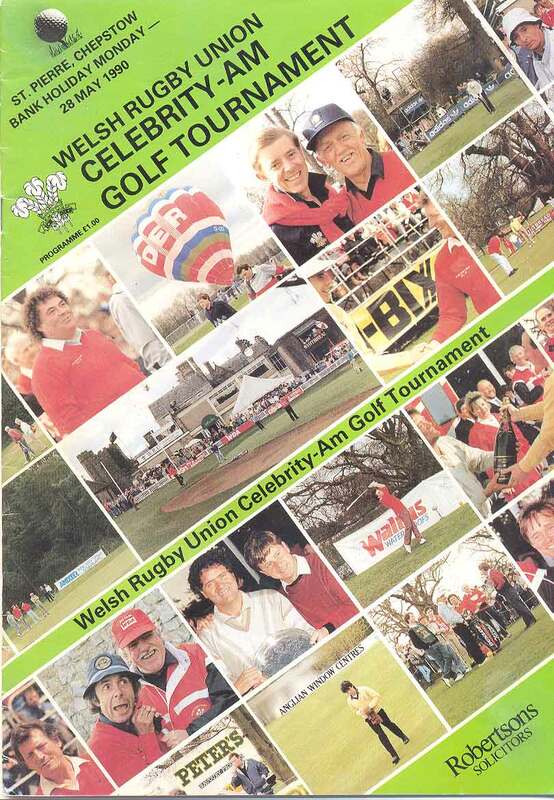 Celebrity Pro-Am Golf Tournament (Welsh Rugby Union) at St Pierre, Chepstow on 28 May 1990. very good condition. 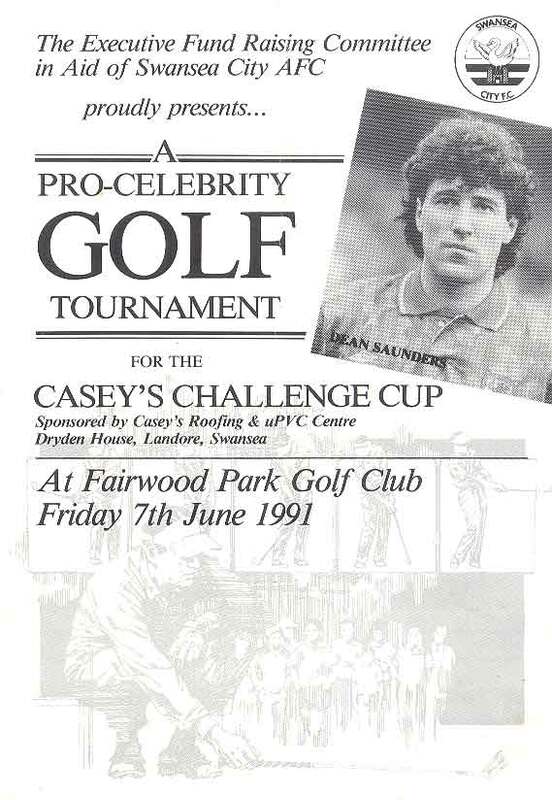 Swansea City - Pro-Celebrity Golf Tournament for the Casey's Challenge Cup in aid of Swansea City AFC at Fairwood Park Golf Club on Friday 7 June 1991. Folding crease. 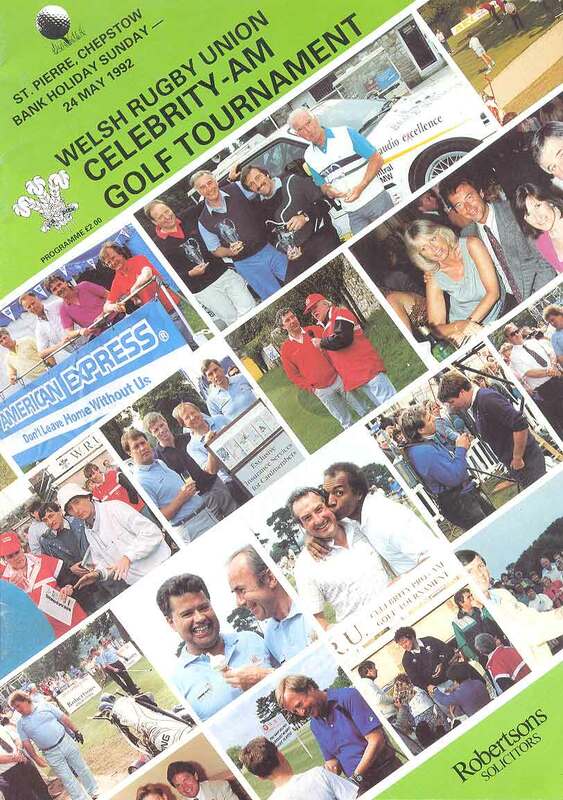 Celebrity Pro-Am Golf Tournament (Welsh Rugby Union) at St Pierre, Chepstow on 24 May 1992. very good condition. 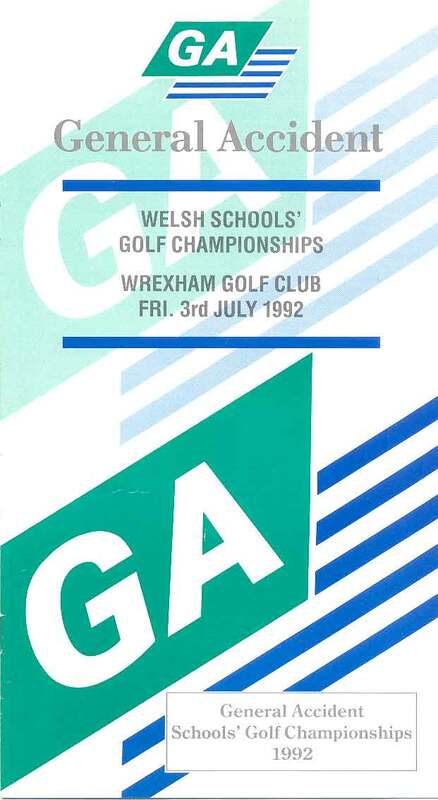 Welsh Schools' Golf Championships at Wrexham Golf Club on 3 July 1992. good condition. 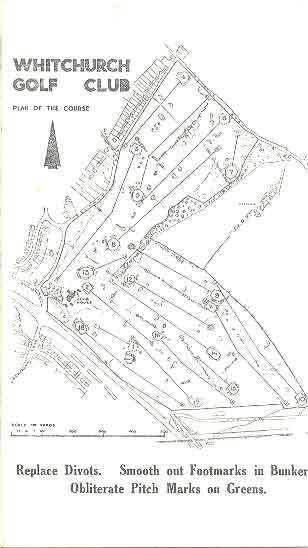 Used scorecard from Llanishen Golf Club dated 4 May 1970. Scores inked in. 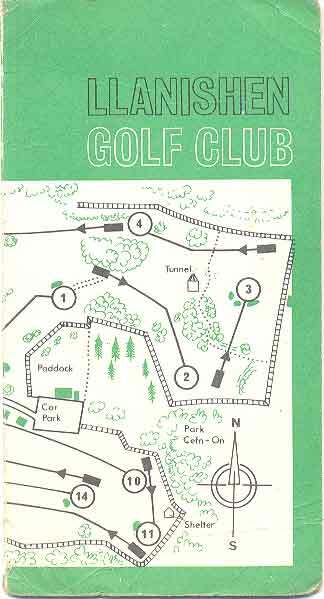 Unused scorecard from Whitchurch (Cardiff) Golf Club. very good condition. 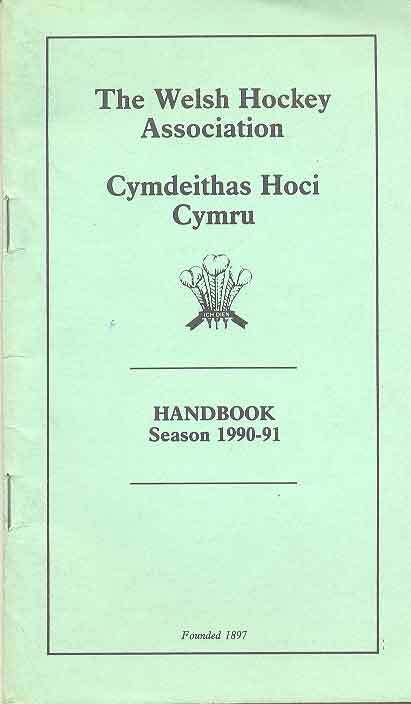 Welsh Hockey Association Handbook Season 1990-1991, 48 pages. Some annotations inside otherwise in very good condition. 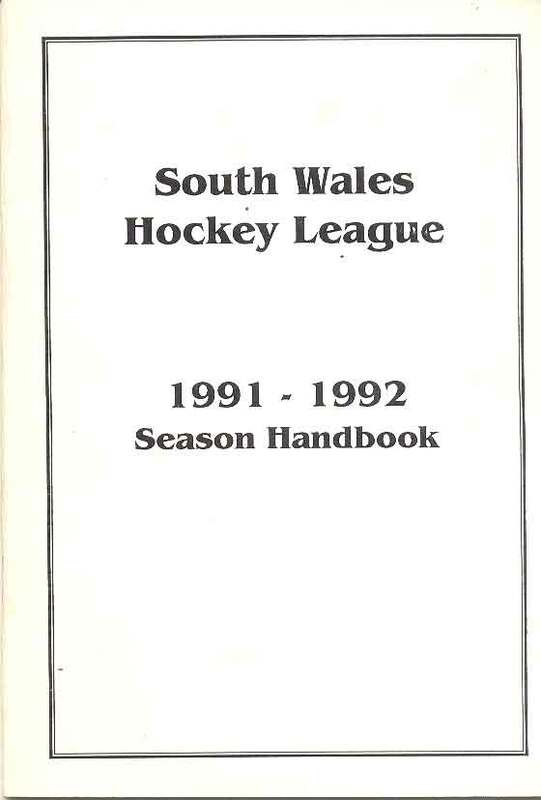 South Wales Hockey League Handbook Season 1991-1992, 28 pages. Very good condition. 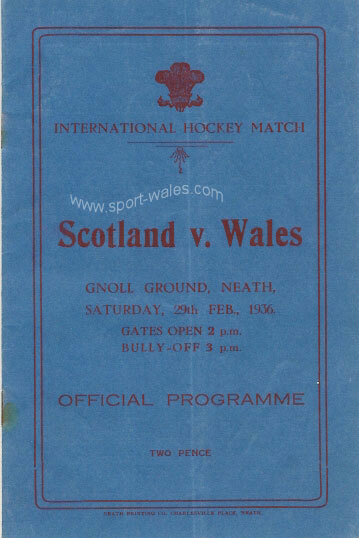 MEN'S HOCKEY - Wales v Scotland, 29th February 1936 at the Gnoll, Neath. 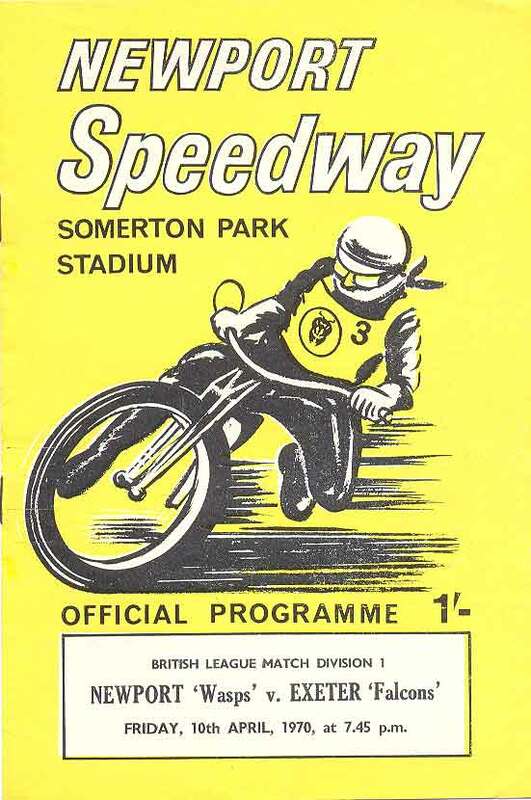 A 16 page programme with a slight crease down the centre, previously removed from a scrapbook, paper attached to back cover. 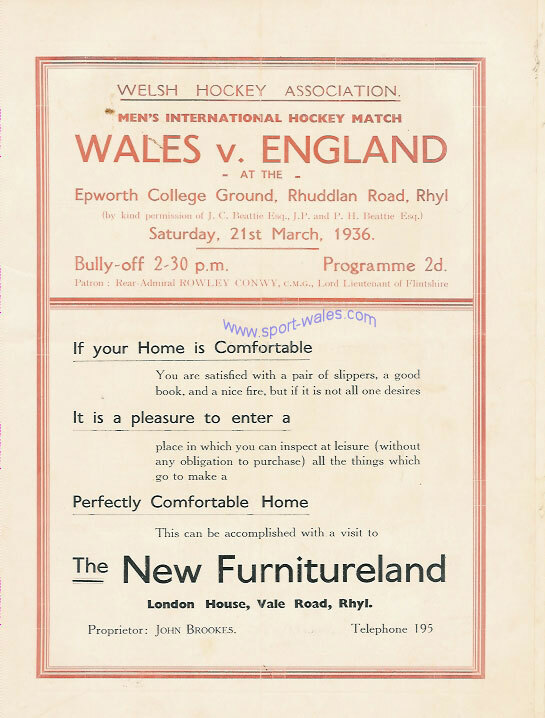 MEN'S HOCKEY - Wales v England 21st March 1936 at Rhyl. 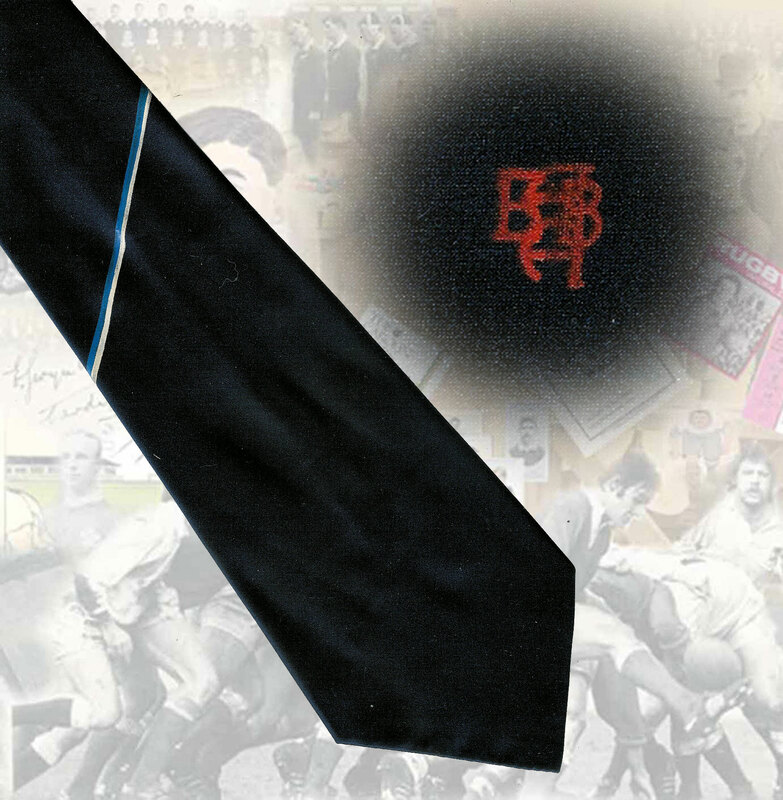 A 12 page programme that has previously been removed from a scrapbook and has paper attached to back cover. 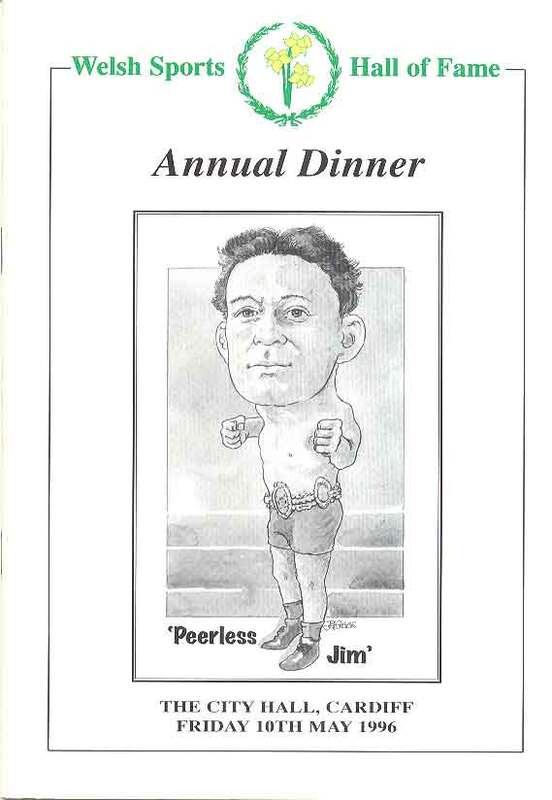 Otherwise the programme is in excellent condition. Chepstow Races - 1 July 1989. very good condition. 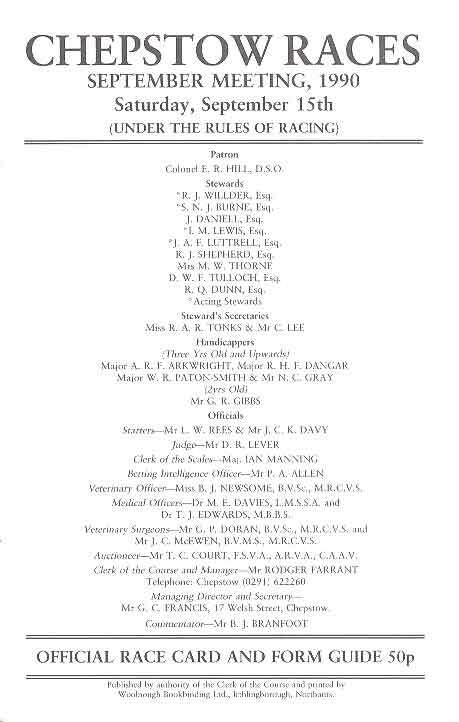 Chepstow Races - 15 September 1990. very good condition. 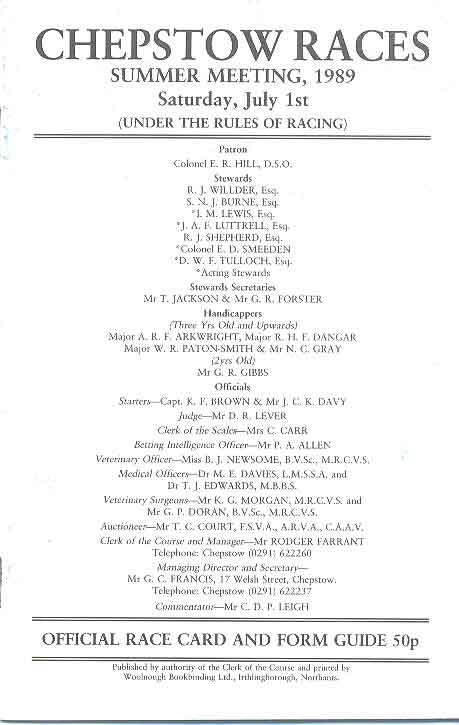 Chepstow Races - 16 October 1990. very good condition. 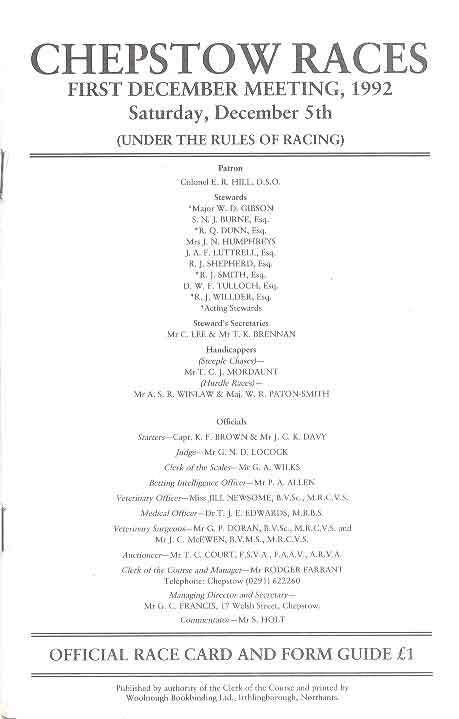 Chepstow Races - 9 March 1991. Slight mark on front cover otherwise in very good condition. 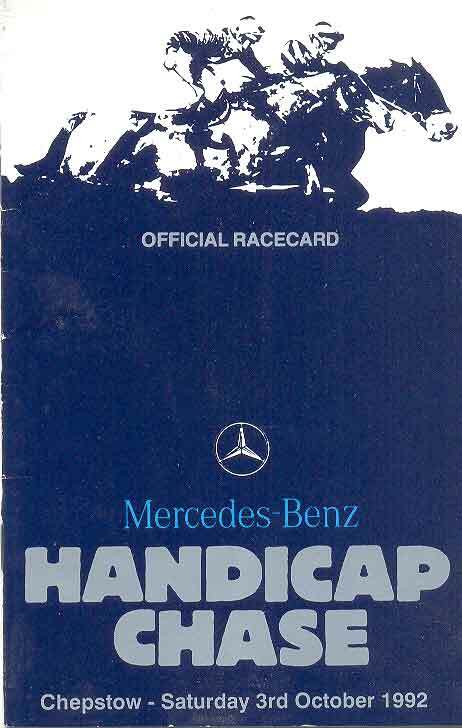 Mercedes-Benz Handicap Chase at Chepstow - 5 October 1991. Slight creases otherwise in very good condition. Chepstow Races - 15 October 1991. Creased. 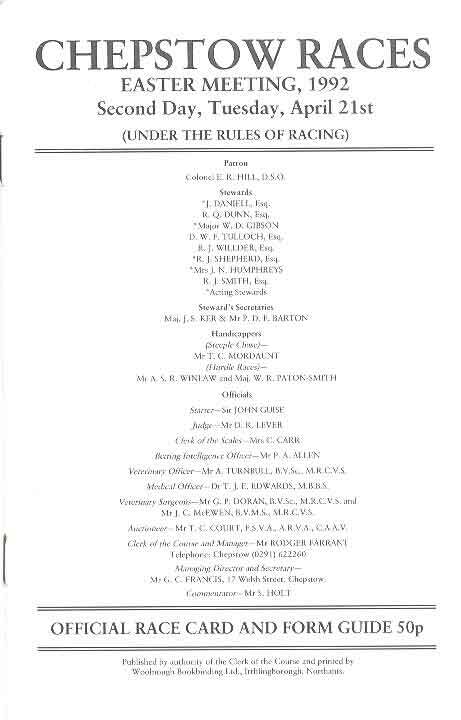 Chepstow Races - 14 March 1992. very good condition. 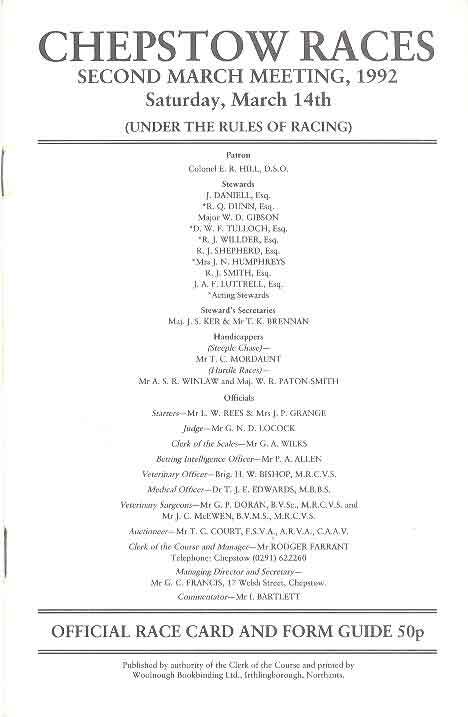 Chepstow Races - 21 April 1992. very good condition. 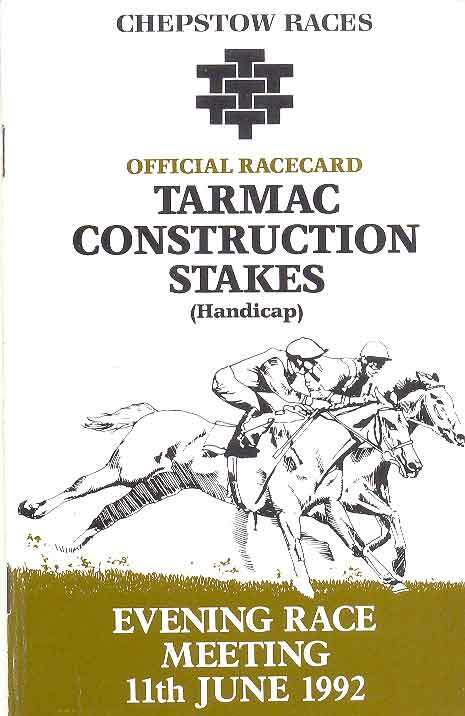 Tarmac Construction Stakes (Handicap) Evening Race Meeting at Chepstow - 11 June 1992. very good condition. Chepstow Races - 31 August 1992. Very good condition. 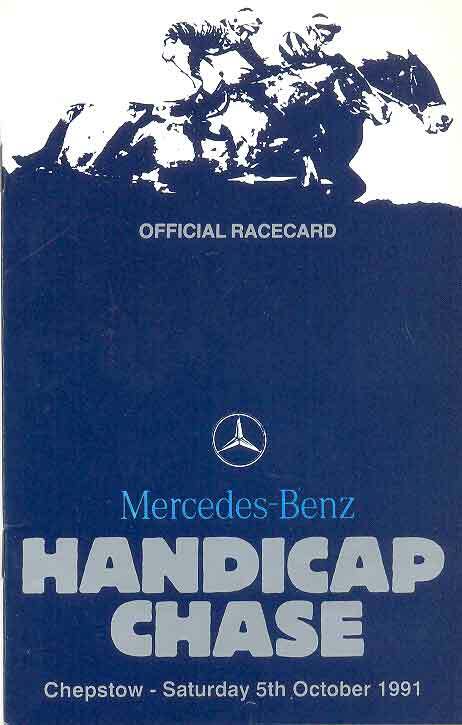 Chepstow Races - Mercedes-Benz Handicap Chase at Chepstow - 3 October 1992.. Slight crease otherwise in very good condition. 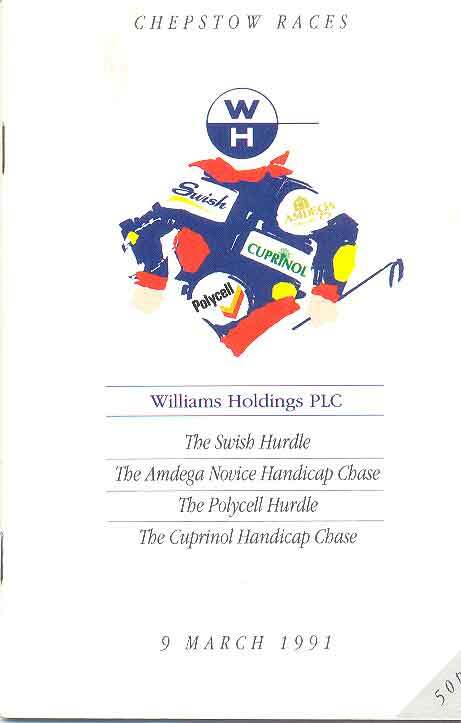 Chepstow Races - 5 December 1992. very good condition. Chepstow Races - 8 July 1993. Slight crease otherwise in good condition. Chepstow Races - 7 July 1994. Very good condition. Chepstow Races - 22 March 2000. Slight marks to front cover otherwise in very good condition. 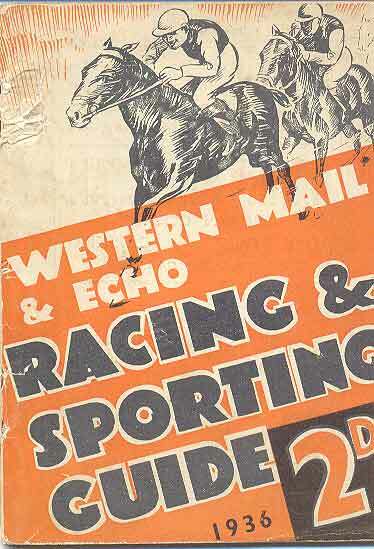 Western Mail & Echo Racing and Sporting Guide 1936. 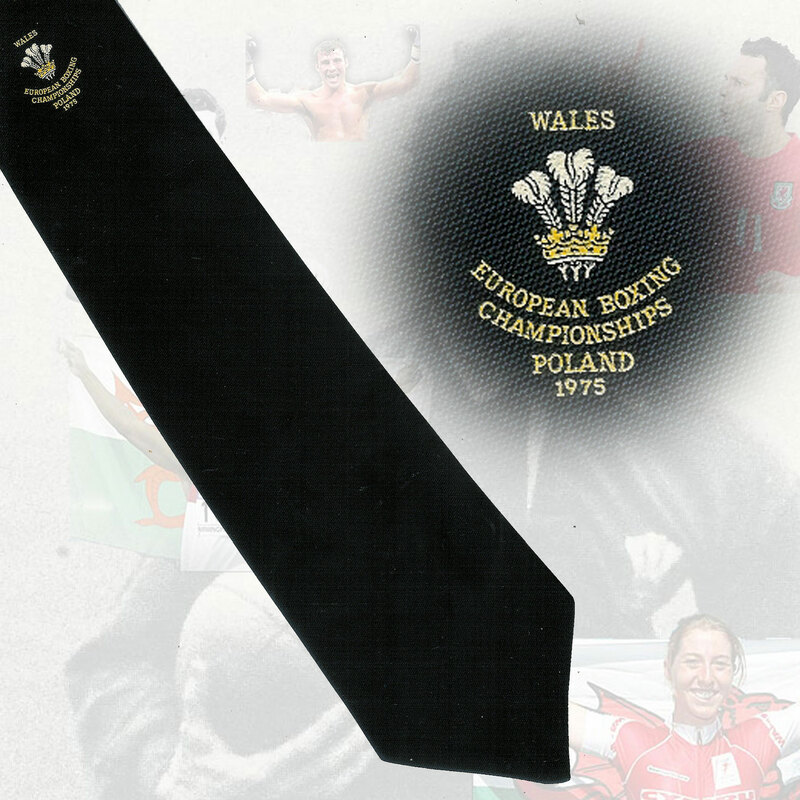 Front & back covers detached, information on horse racing and many other Welsh sports including: swimming, greyhound racing, bowls, gymnastics, hockey, tennis, baseball, golf, athletics, cycling, boxing, table tennis, billiards & snooker. 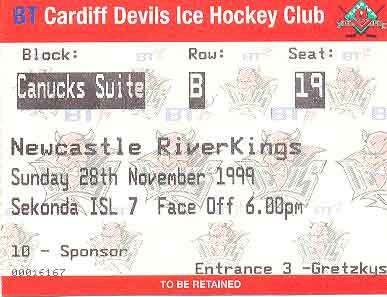 Cardiff Devils v Newcastle Riverkings at Wales National Ice Rink, Cardiff on 28 November 1999. very good condition. 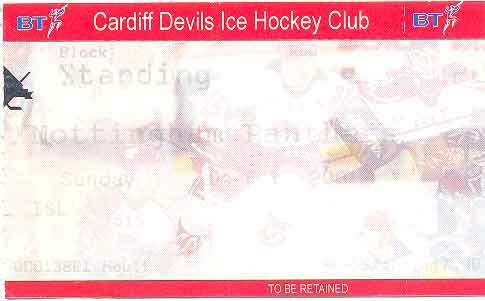 Cardiff Devils v Nottingham Panthers at Wales National Ice Rink, Cardiff on 4 February 2001. Print fading and creased. Cardiff Devils v Sheffield Steelers at Wales National Ice Rink, Cardiff on 28 January 2001. Creased. 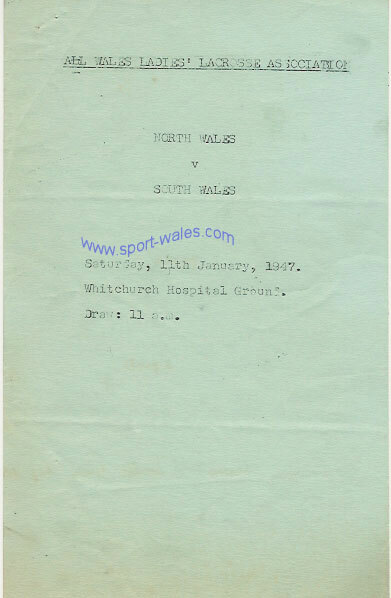 LADIES LACROSSE - South Wales v North Wales 11th January 1947, a 4 page programme for match played at Whitchurch Hospital Grounds, Cardiff. 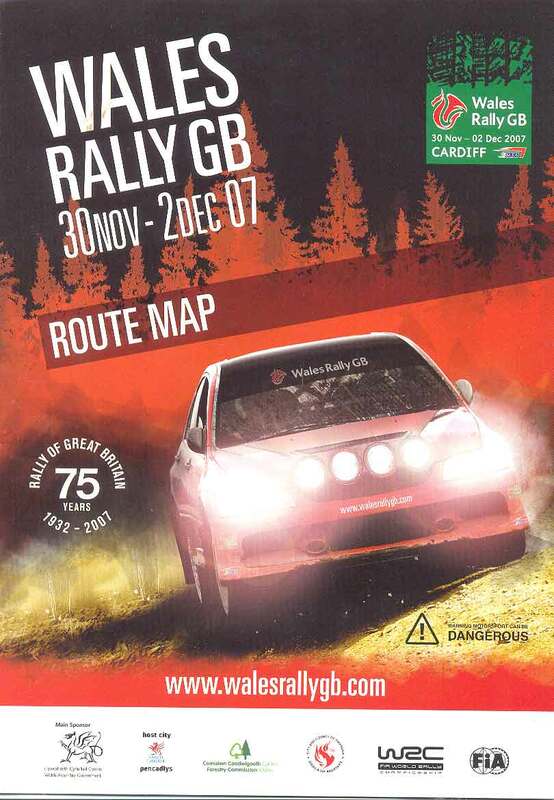 Official Programme, very good condition. about 20 - 30 loose A4 sheets (not illustrated) comprising of stage results and media information sheets. 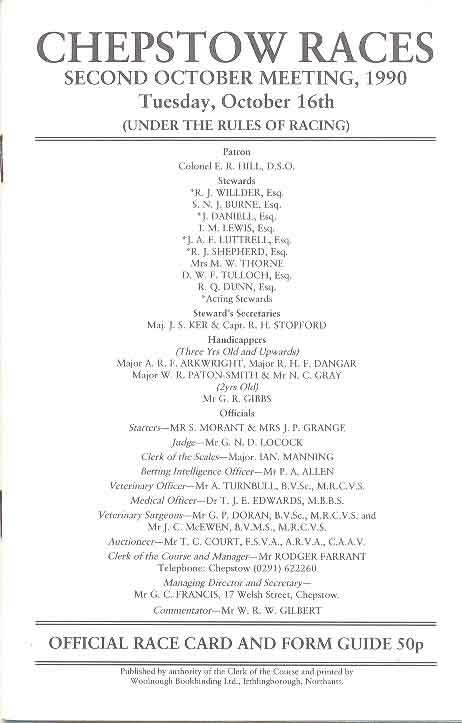 Altogether this makes an interesting archive. 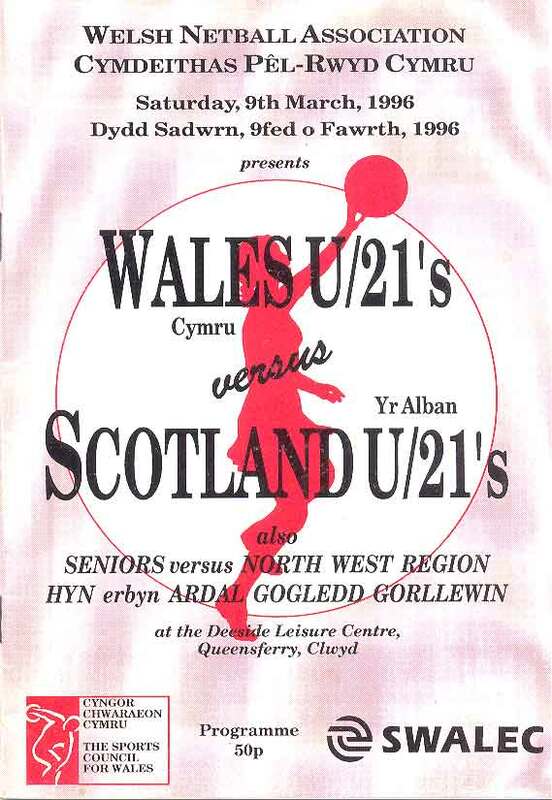 Wales Under 21 v Scotland Under 21 also Seniors v North West Region at Deeside Leisure Centre, Queensferry on 9 March 1996. very good condition. 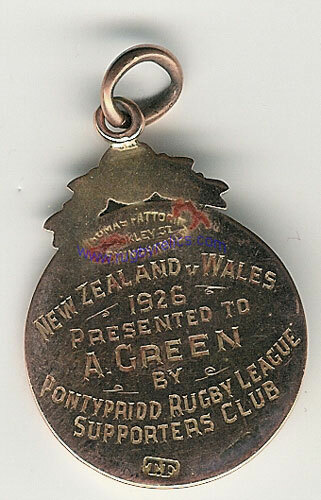 Gold medal awarded to Albert Green (Thomas Albert Green later to become Albert Jones) by Pontypridd Rugby League Supporters Club on the occasion of him playing for Wales against New Zealand in 1926. 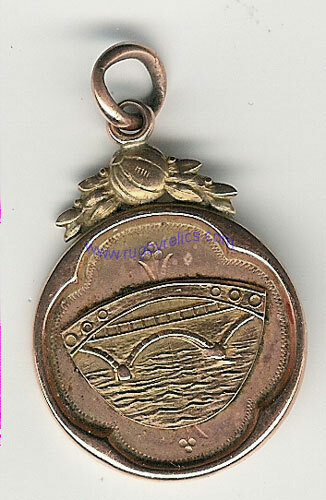 The medal by Thomas Fattorni, Birmingham is 35mm x 25mm in size. SWEDEN v AUSTRALIA at Somerton Park Stadium, Newport on 6 July 1973. Very good condition. Newport Wasps v Exeter Falcons at Somerton Park Stadium on 10 April 1970. Very good condition with some results inked inside. 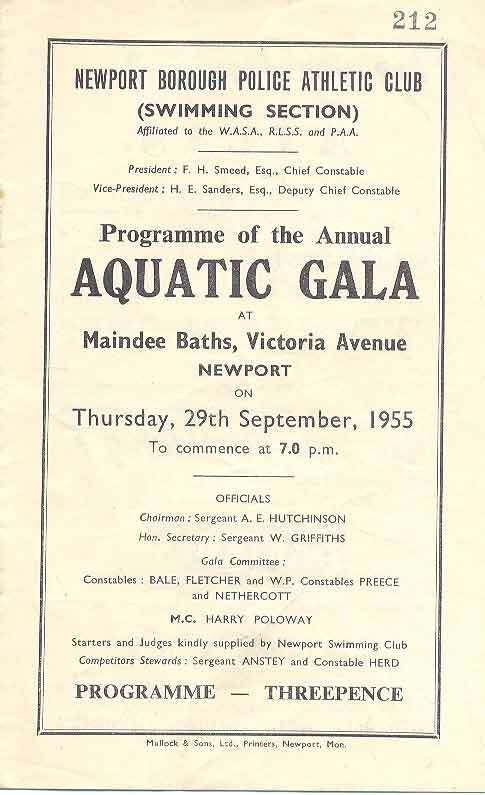 Newport Borough Police Annual Aquatic Gala at Maindee Baths, Newport on 29 September 1955. Minor creases. 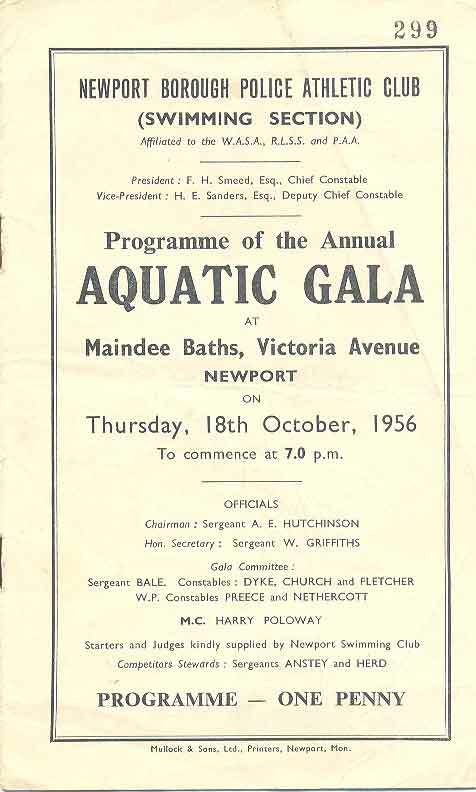 Newport Borough Police Annual Aquatic Gala at Maindee Baths, Newport on 18 October 1956. Minor creases. 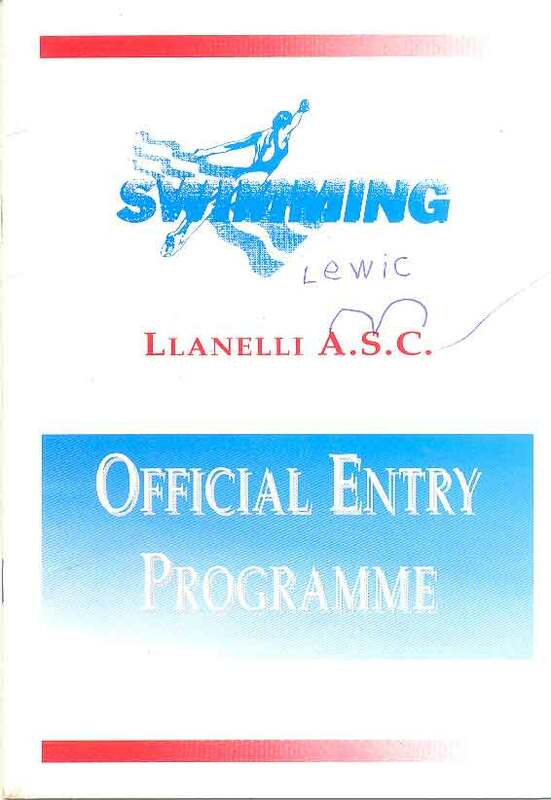 Llanelli Amateur Swimming Club Junior/Novice Gala on 28 September 1996. Some annotations inside and writing to front cover. 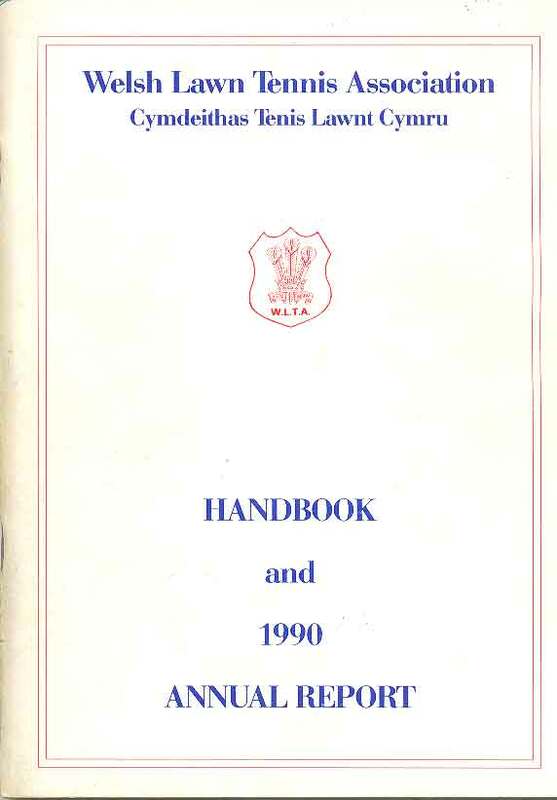 Welsh Lawn Tennis Association Handbook and 1990 Annual Report, includes results, rankings, club info, international info, a comprehensive publication, 96 pages in good condition. 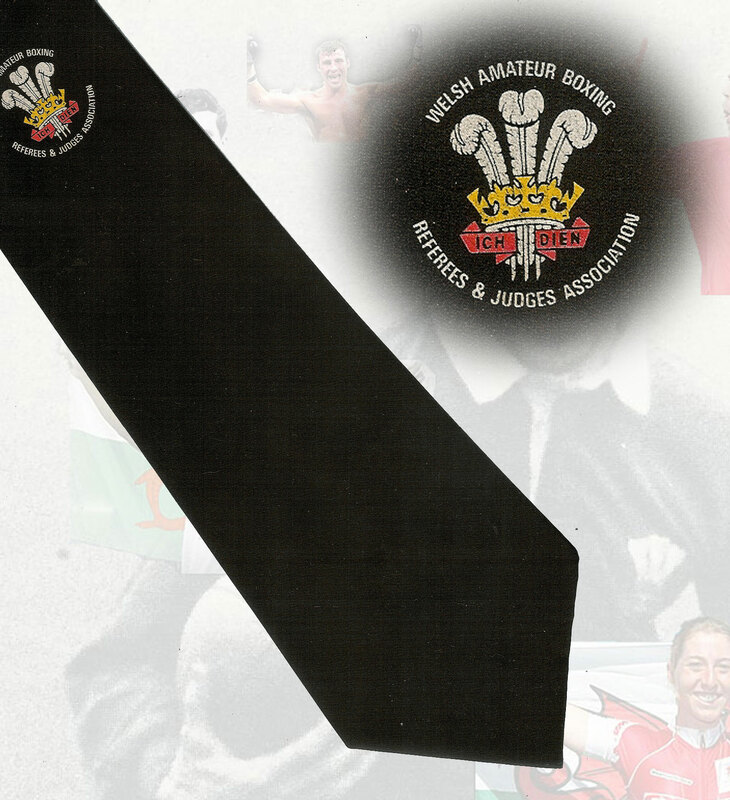 Welsh Triathlon Association window sticker (196mm x 87mm). very good condition. 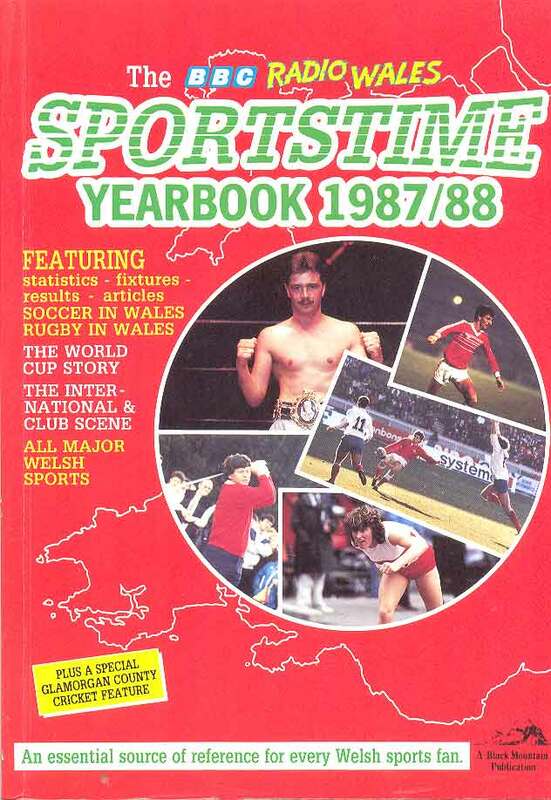 BBC Radio Wales Sportstime Yearbook 1987-88 - featuring statistics, fixtures, results and articles on all major Welsh sports. A 224-page soft back edited by Terence O'Donohue, in very good condition. 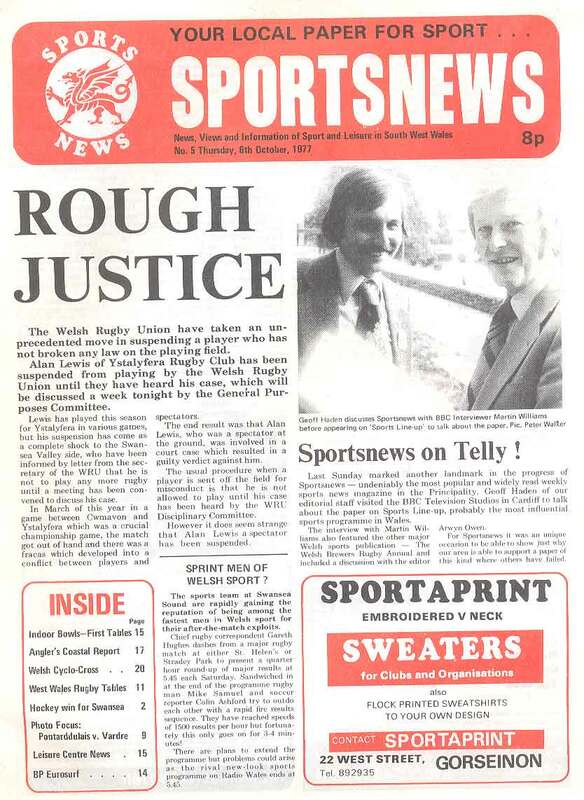 Swansea - Sports Gazette - No 4 - October 1980 - A 24-page fortnightly sports paper printed in Swansea - issue 4 (approx October 1980). 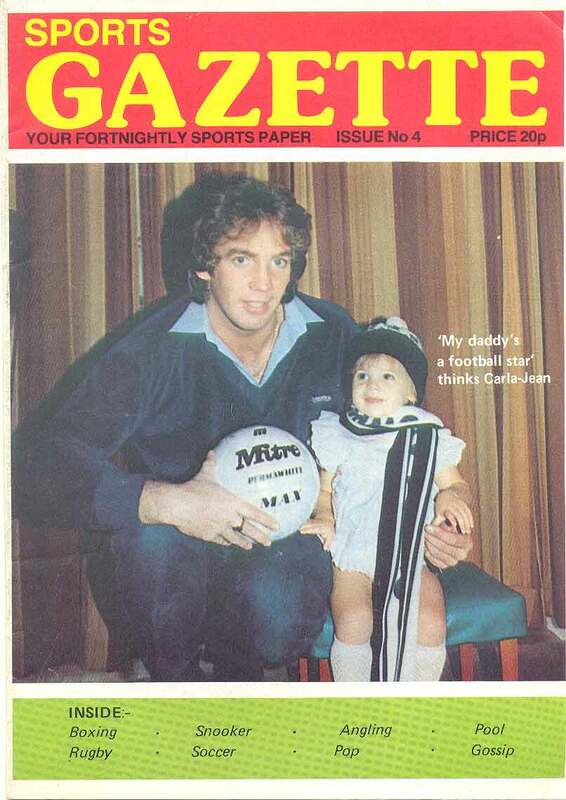 Front cover photo of Alan Waddle Includes pool and snooker, Llanelli 10 New Zealand 16, West Wales Chess League, angling, Swansea City, weight-lifting. Very good condition. 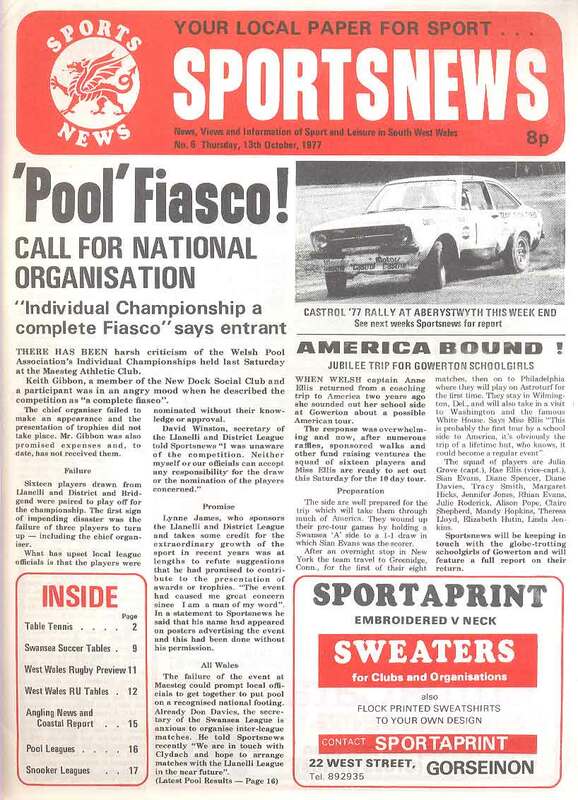 Swansea - Sportsnews - No 1 - 8 September 1977 - A 16-page weekly sports paper printed in Swansea with news, views and information of sport and leisure in South West Wales - issue 1 - 8 September 1977. Includes judo in Swansea, South Wales Cricket Association Championship, Cefn Hengoed netball, also local soccer, badminton & bowls. Very good condition. 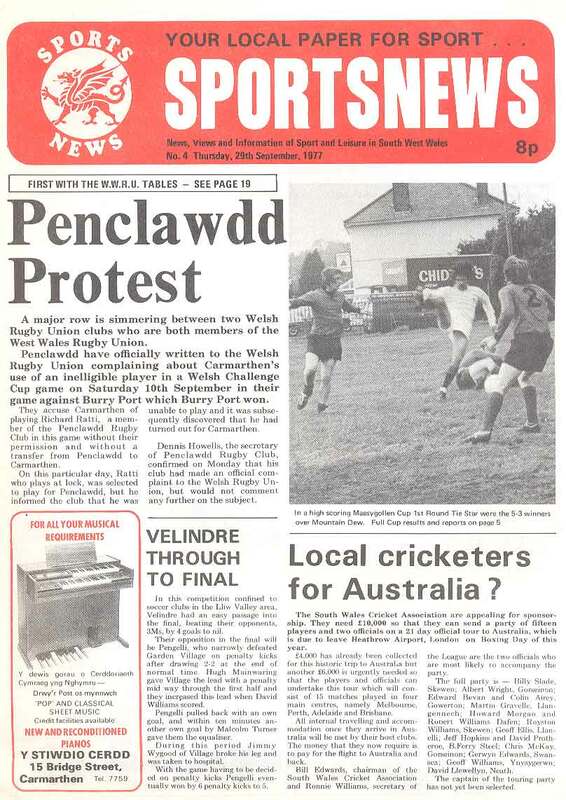 Swansea - Sportsnews - No 3 - 22 September 1977 - A 20-page weekly sports paper printed in Swansea with news, views and information of sport and leisure in South West Wales - issue 3 - 22 September 1977. 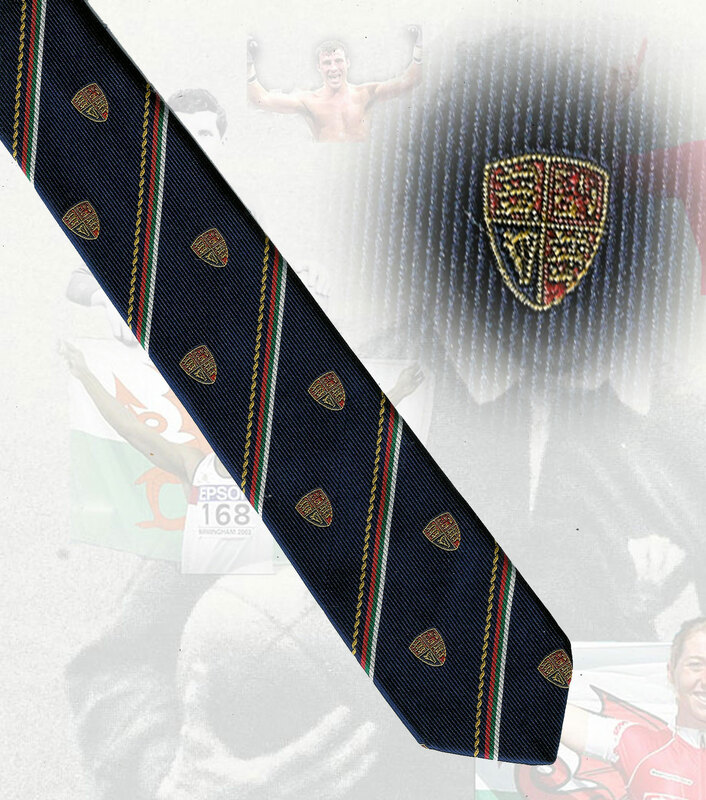 Includes rugby referees, soccer, Port Talbot Motor Club, profile of Harry Griffiths, local bowls darts, pool & snooker. Very good condition. Swansea - Sportsnews - No 4 - 29 September 1977 - A 20-page weekly sports paper printed in Swansea with news, views and information of sport and leisure in South West Wales - issue 4 - 29 September 1977. Includes Penclawdd RFC, local cricketers for Australia, indoor hockey for Swansea, profiles of Mervyn Davies, local soccer & rugby, angling, local pool, snooker & darts, rallying & surfing. Very good condition. Swansea - Sportsnews - No5 - 6 October 1977 - A 20-page weekly sports paper printed in Swansea with news, views and information of sport and leisure in South West Wales - issue 5 - 6 October 1977. 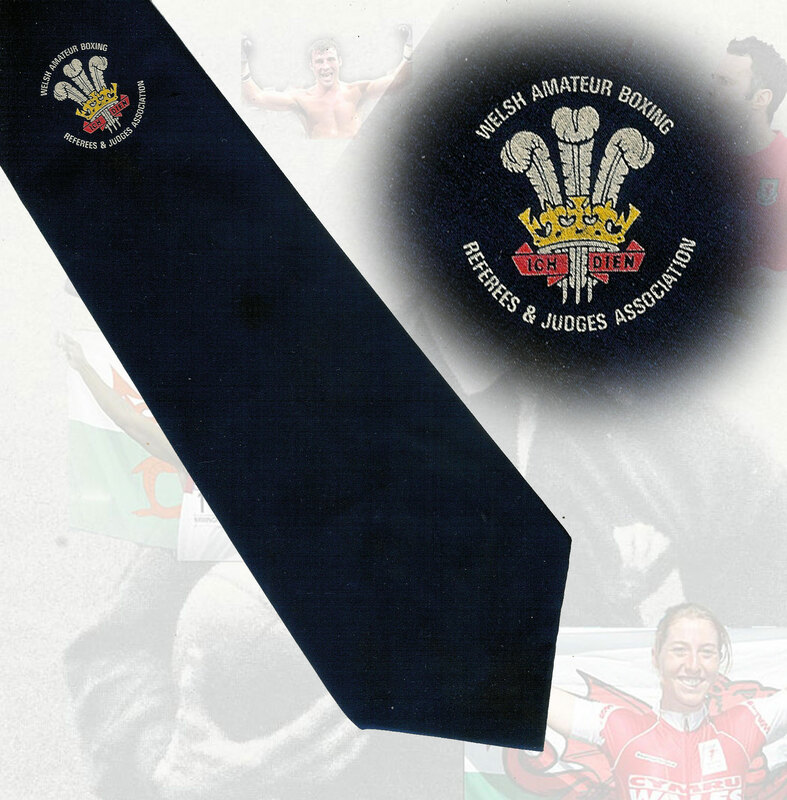 Includes athletic, sport on TV, indoor bowls, angling, profile of Ivor Allchurch, West Wales rugby, Swansea hockey, local soccer, photos of Wern Athletic, AWCO, rugby, photos of Pontarddulais v Vardre, pool, snooker, school boys cross country, squash and Welsh Rally. Very good condition. Swansea - Sportsnews - No6 - 13 October 1977 - A 20-page weekly sports paper printed in Swansea with news, views and information of sport and leisure in South West Wales - issue 6 - 13 October 1977. 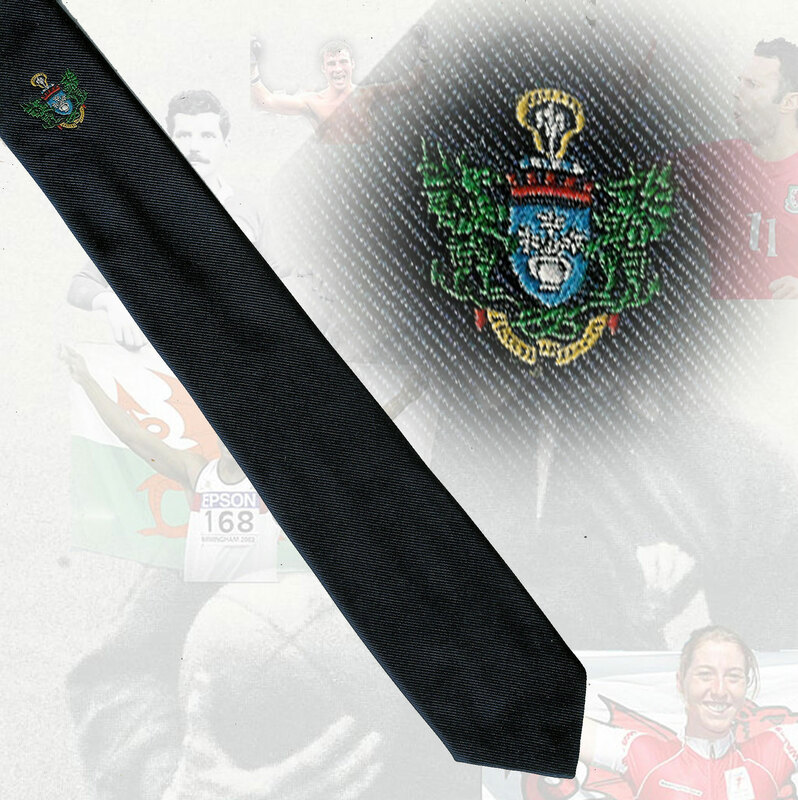 Includes table tennis, local soccer, photos of Port Tennant Colts and Hafod Brotherhood, Briton Ferry and rugby tables, photo of Swansea Uplands & Llangennech angling, local pool & snooker leagues, netball, athletics and racquet sports. Very good condition. 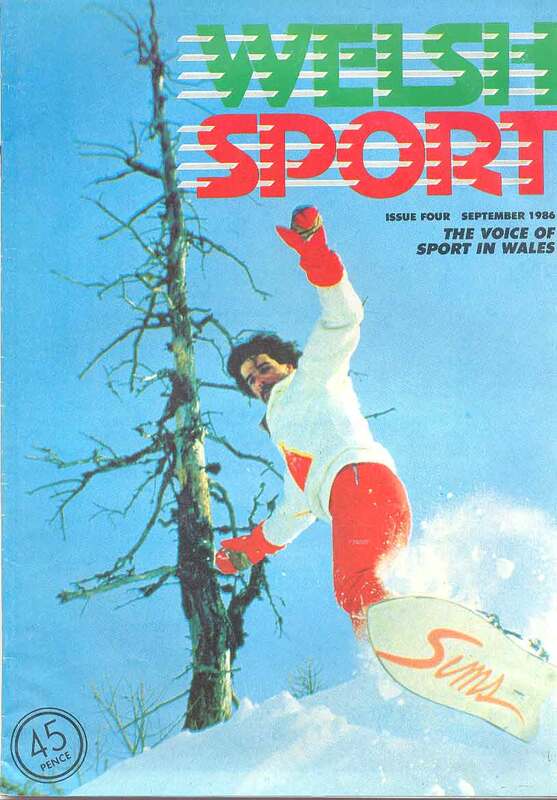 Welsh Sports View - issue 1 - January 1977. 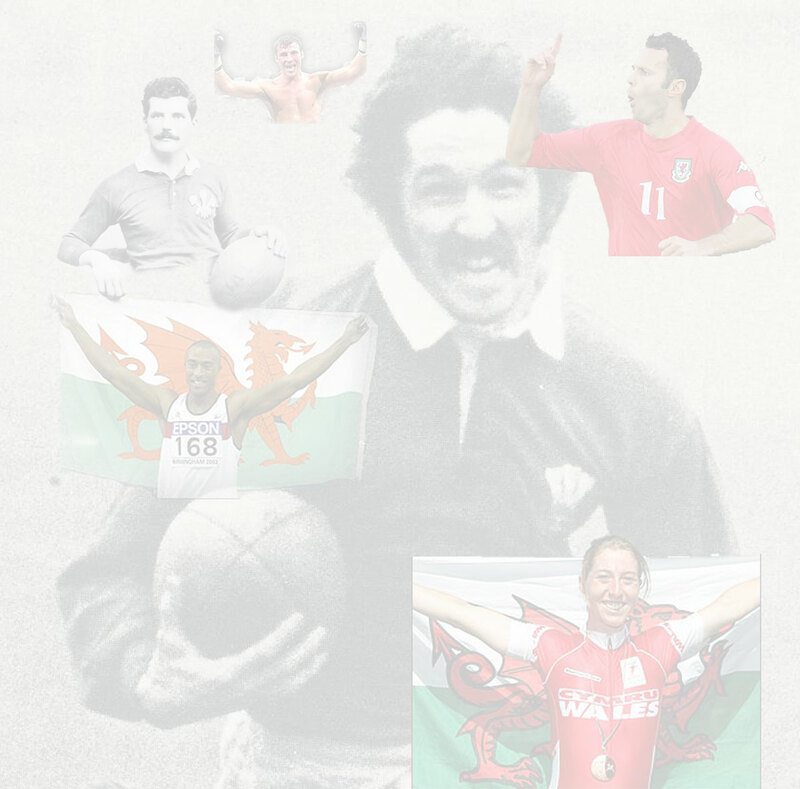 John Toshack front cover photo Includes Lynn Davies profile, centres of controversy, women in sport, save our soccer, profile of Nan Thomas (Wales Hockey Coach), profile of Kelvin Smart. 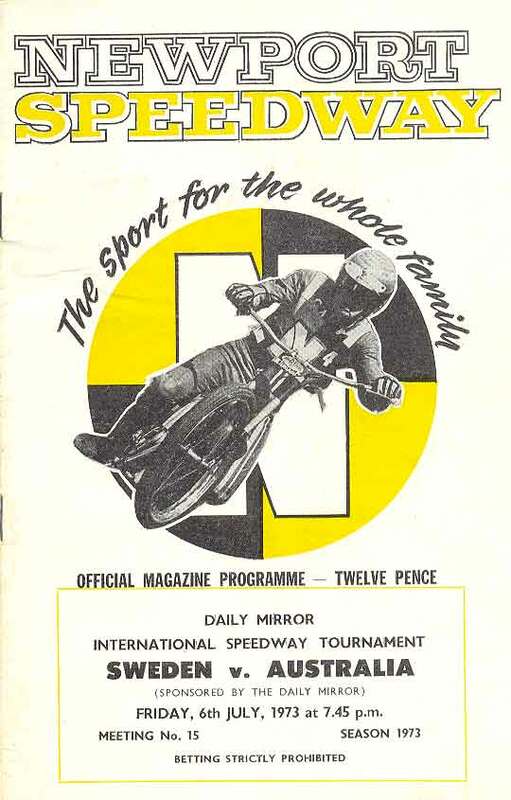 A 40-page monthly sports magazine - Very good condition. 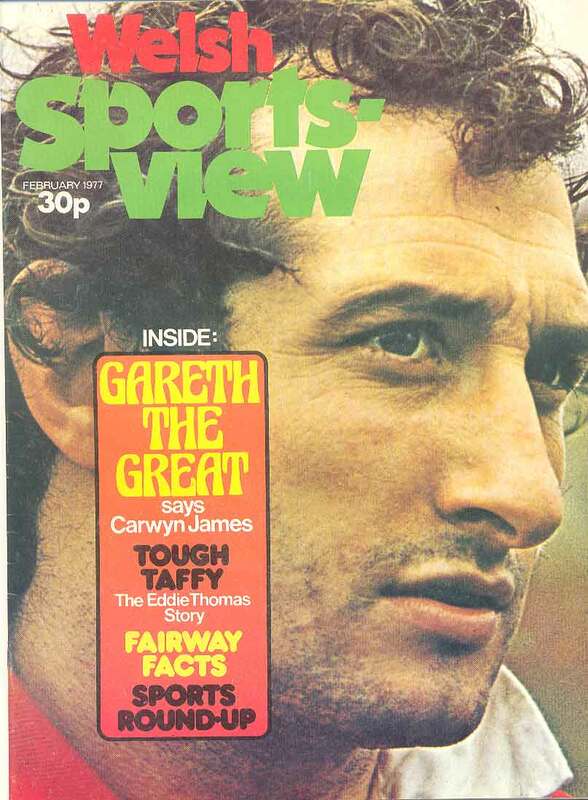 Welsh Sports View - issue 2 - February 1977. 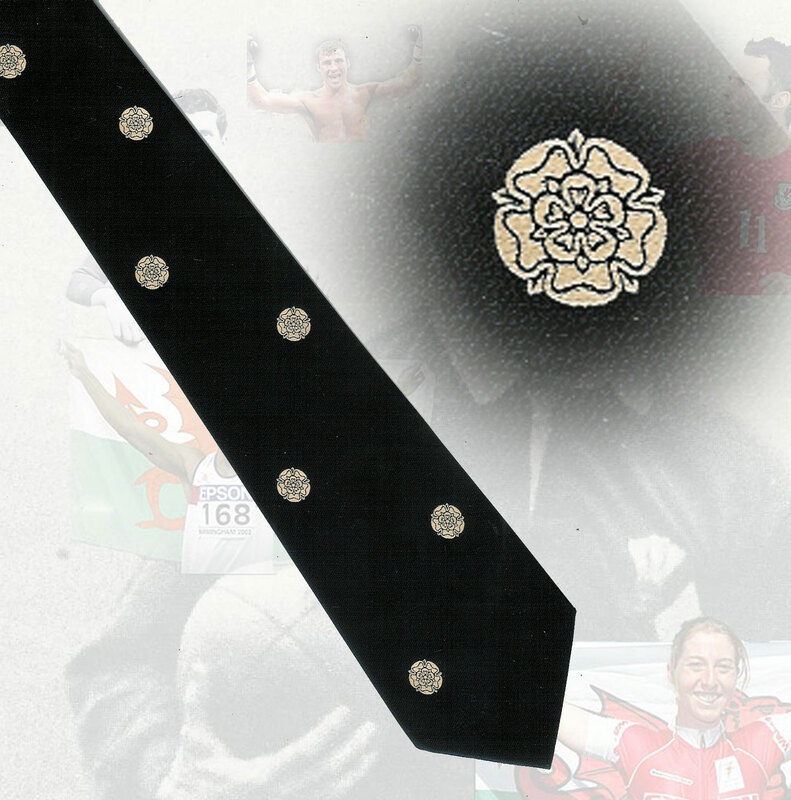 Includes profile of Jeremy Charles, Welsh hockey, Welsh gold scene, profile and front cover photo of Gareth Edwards, rugby league gossip, profile of boxer Eddie Thomas. A 36-page monthly sports magazine - Very good condition. 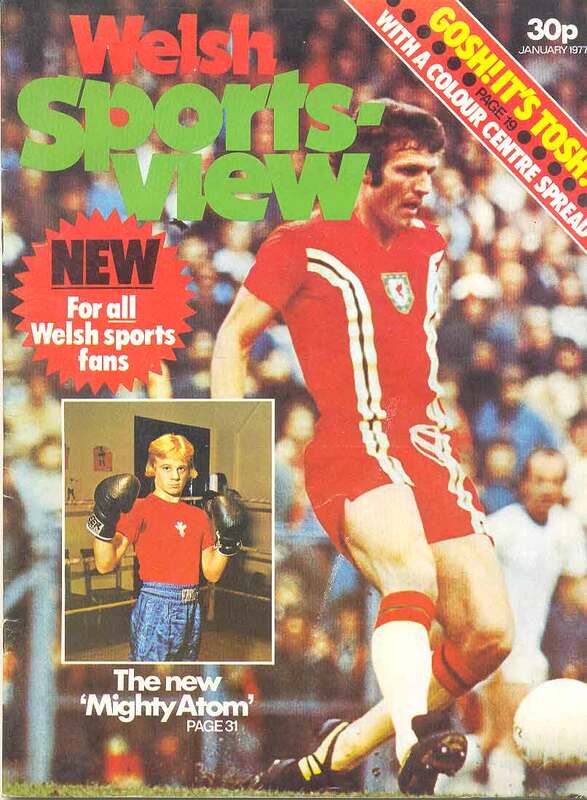 Welsh Sports View - issue 4 - April 1977. 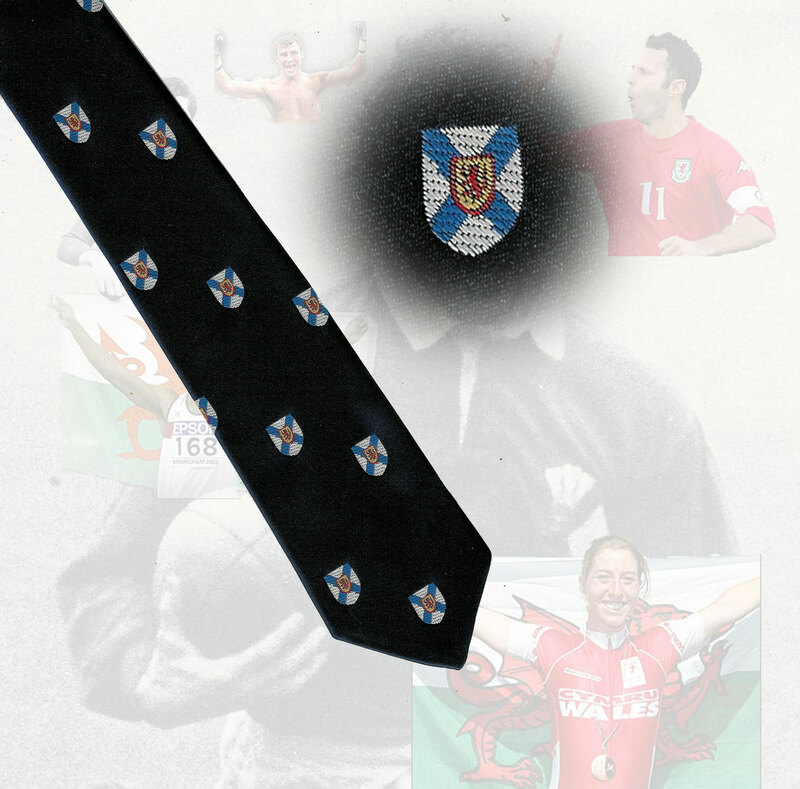 Includes interview with Wales soccer manager Mike Smith, Welsh darts, Welsh gold scene, Welsh lacrosse, City of Cardiff Swimming Club, rugby league and Welsh hockey. A 36-page monthly sports magazine - Very good condition. 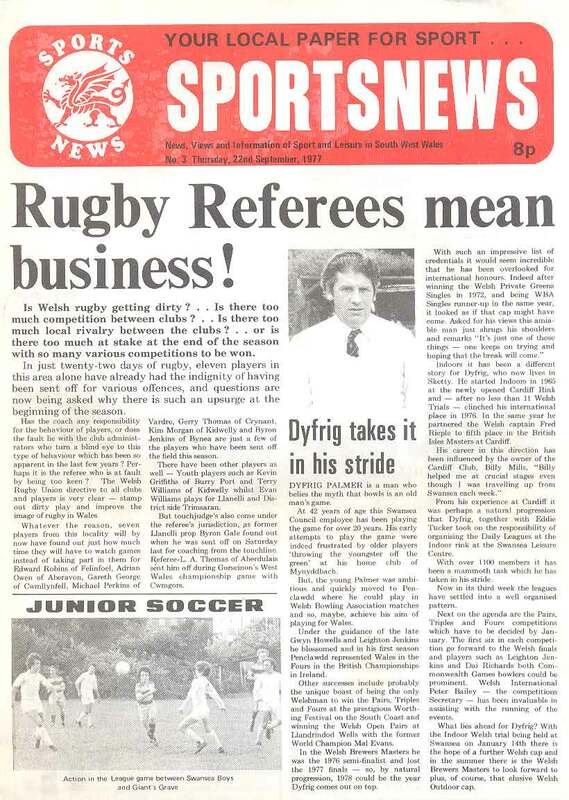 Welsh Sport - issue 4 - September 1986. 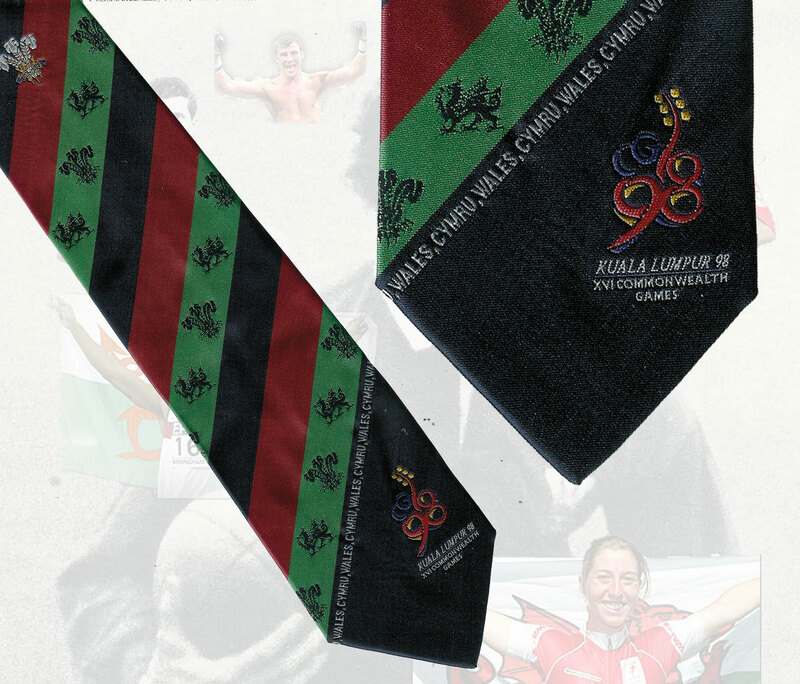 Welsh badminton, Welsh schools cricket, cycling in Wales, Welsh cyclo-cross, ice skating, Welsh judo & karate, Welsh netball, Welsh Cross Country, skiing and table tennis. A 32-page monthly sports magazine - Very good condition. 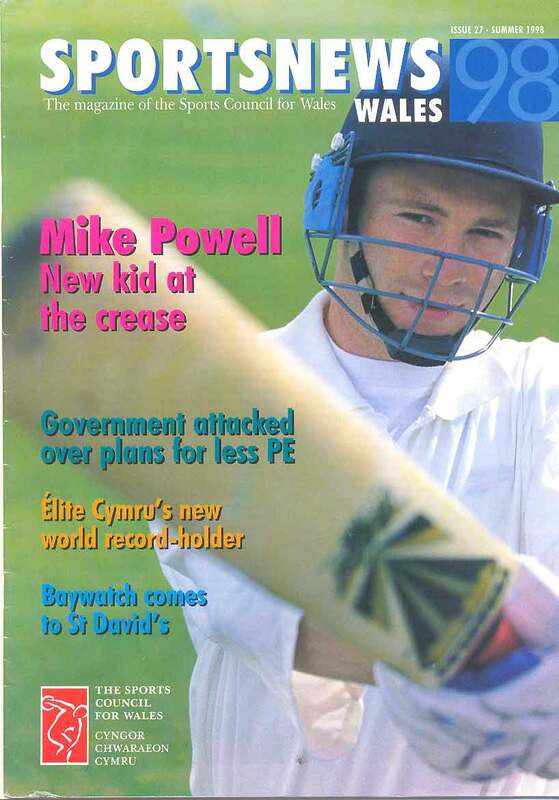 Welsh Sport Cymru - issue 1 - December 1997. 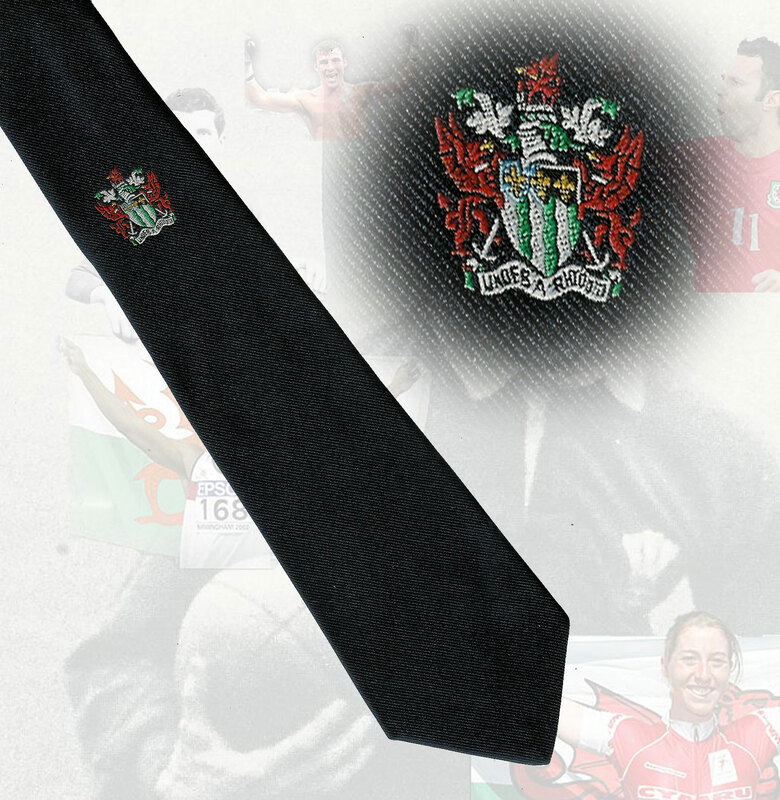 Includes profiles of Joe Calzaghe, Andy Moore, Mark Hughes David Temme (President of Cardiff Devils) and Non Evans, Glamorgan are the champs, Wrexham FC and Swansea RFC. A 52-page monthly sports magazine - Very good condition. 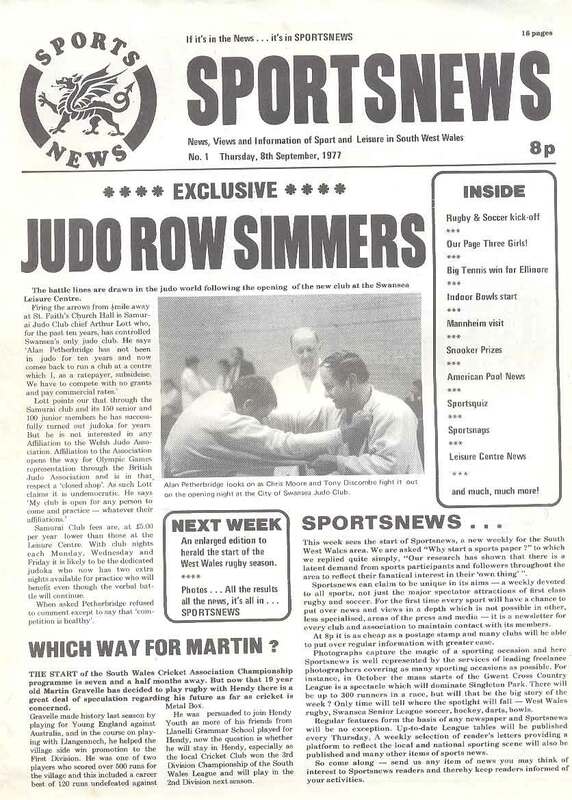 Sportsnews Wales - The magazine of the Sports Council for Wales - issue 27 - Summer 1998. 14 pages in English and the same 14 pages in Welsh back-to-back. Includes profile of Kelly Morgan (badminton), women's soccer and hockey, hand gliding and paragliding, wheelchair rugby & disabled sport, Surf Lifeguard Championships of Wales, profile of Glamorgan's Mike Powell. Very good condition. Rhondda Valley - Just Rentals Hall of Fame '93 Sports Awards - luncheon acknowledging sports men and women in the Rhondda Valley. 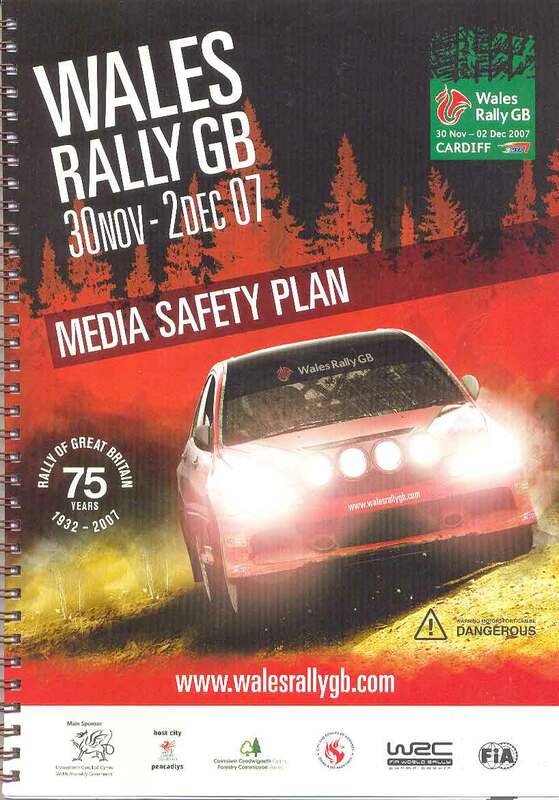 A 24-page programme for with marks to the front cover otherwise in good condition. 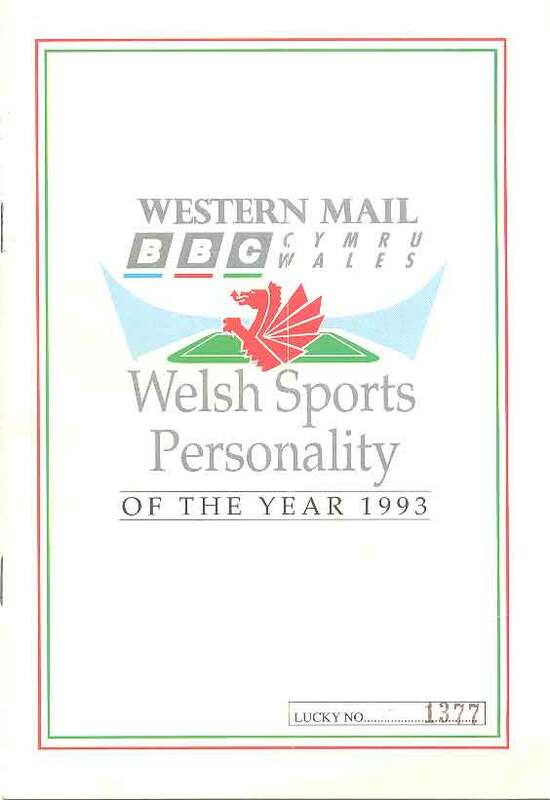 Western Mail/BBC Cymru Wales Welsh Sports Personality of the Year 1993 - An 8-page programme including all complete list of past winners. Folding crease. 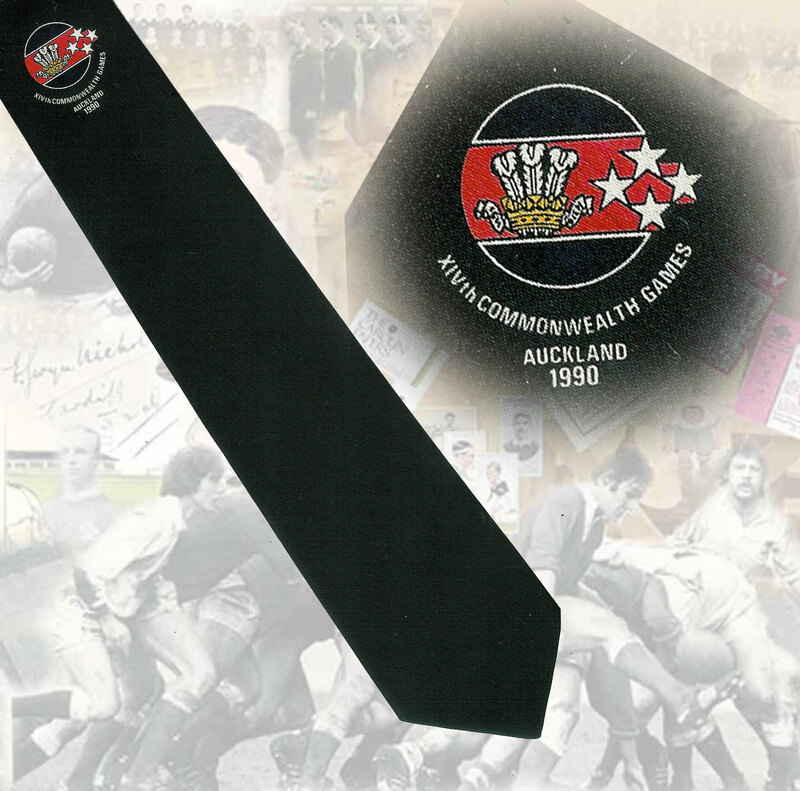 Welsh Sports Hall of Fame Annual Dinner - A 12-page programme/dinner menu at The City Hall, Cardiff on 10 May 1996. Very good condition. 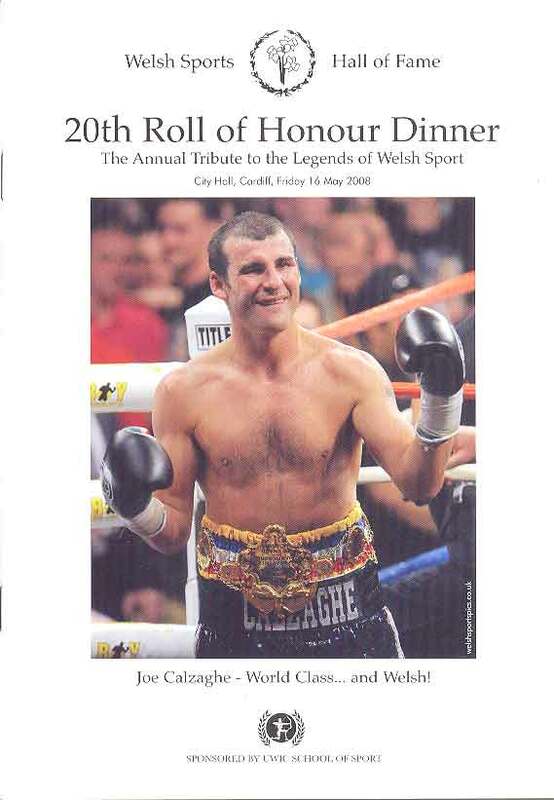 Welsh Sports Hall of Fame 20th Roll of Honour Dinner - A 12-page programme/dinner menu at The City Hall, Cardiff on 16 May 2008. very good condition. 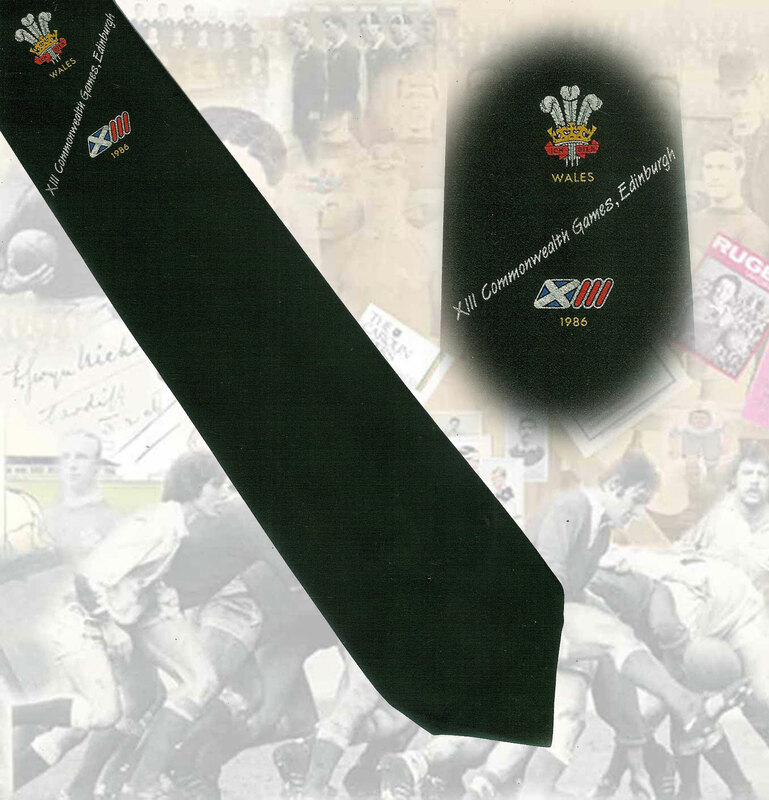 Welsh Sports Hall of Fame 21st Roll of Honour Dinner - A 12-page programme/dinner menu at The City Hall, Cardiff on 5 June 2009. very good condition. 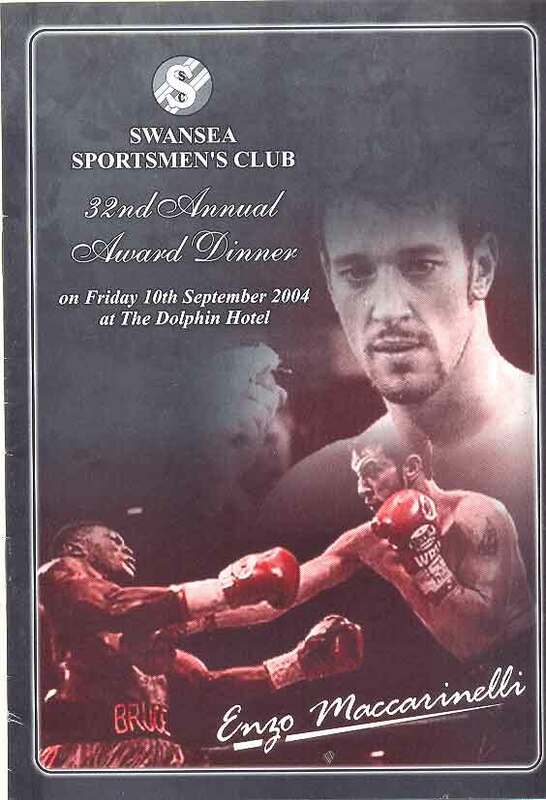 Swansea Sportsmen's Club - 32nd Annual Award Dinner - a tribute to Enzo Maccarinelli - A 16-page programme/dinner menu at The Dolphin Hotel on 10 September 2004. very good condition. 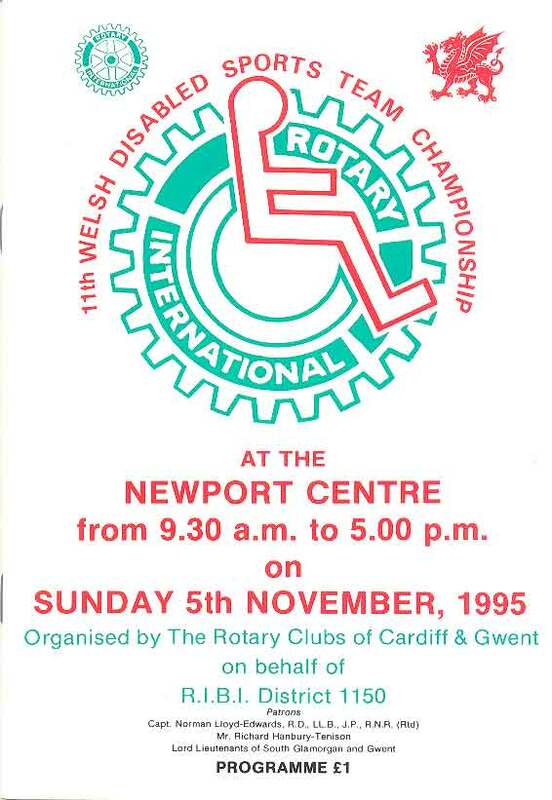 11th Welsh Disabled Sports Team Championships at the Newport Centre on 5 November 1995 - A 32-page programme. very good condition.